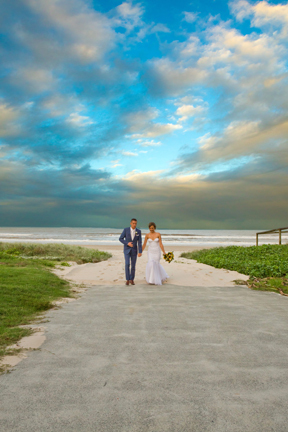 So often I find wedding couples choosing to have their wedding photography-Stradbroke Island are really easygoing and always easy to work with before and on the big day. 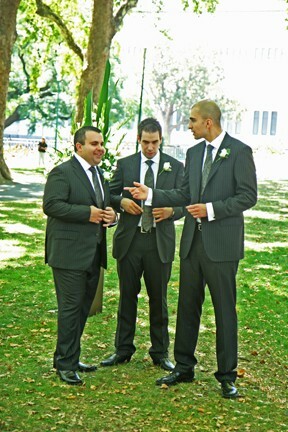 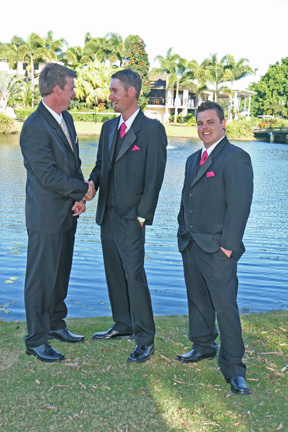 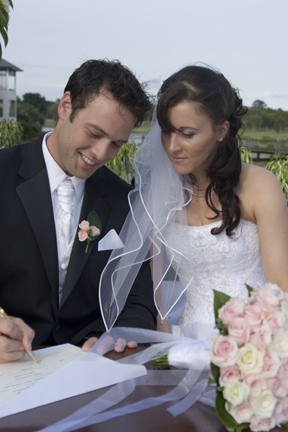 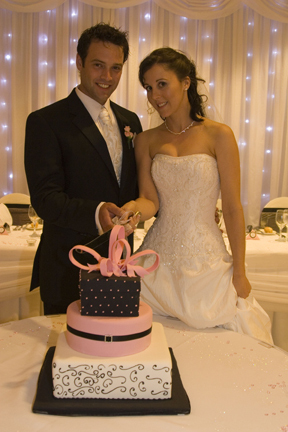 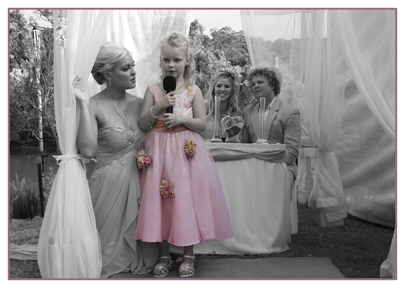 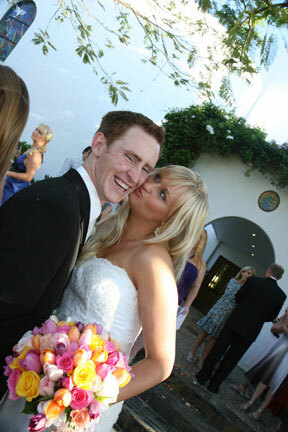 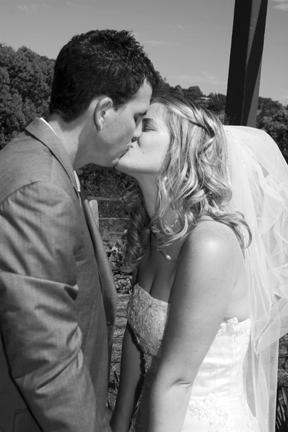 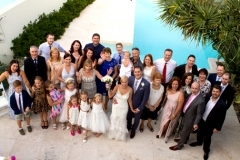 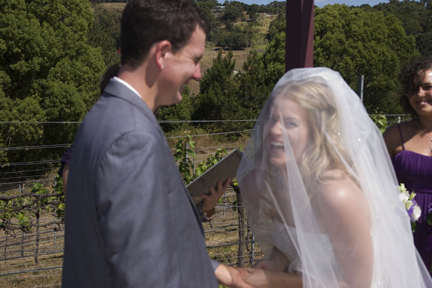 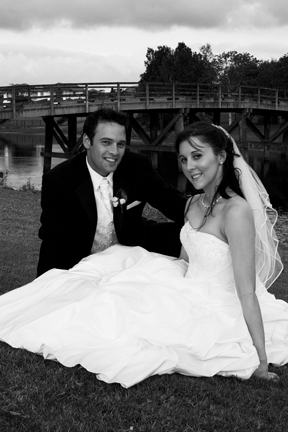 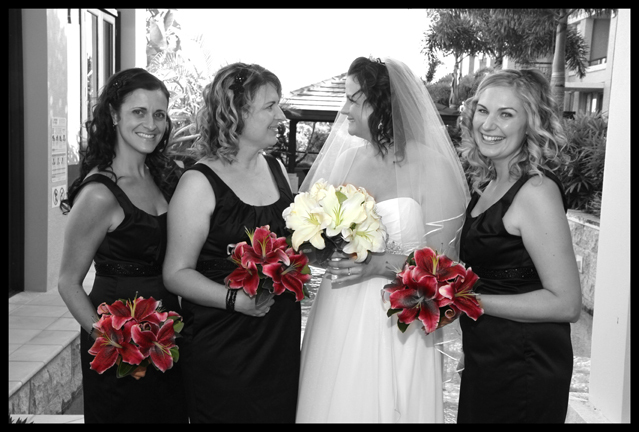 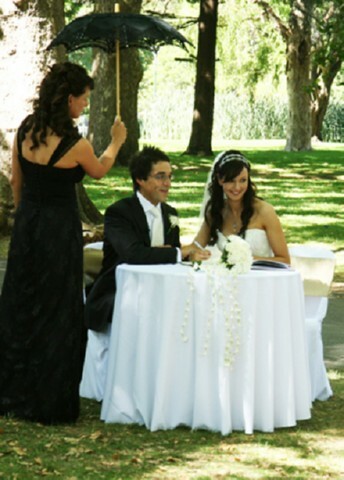 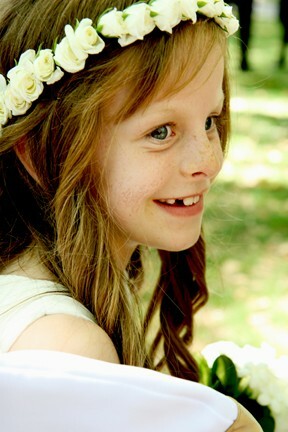 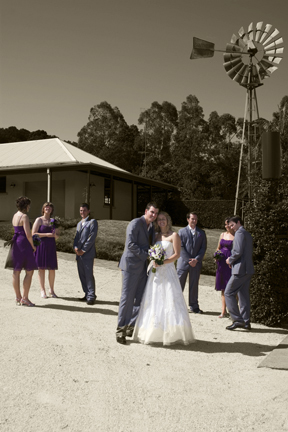 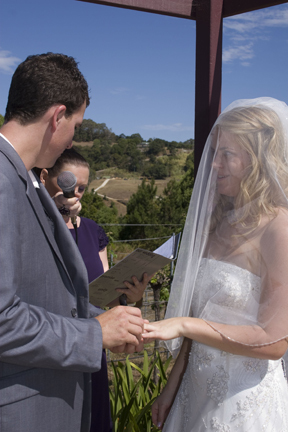 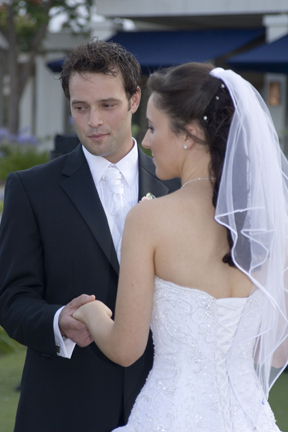 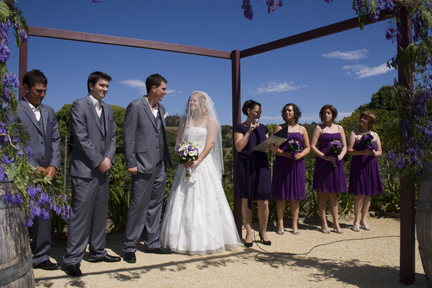 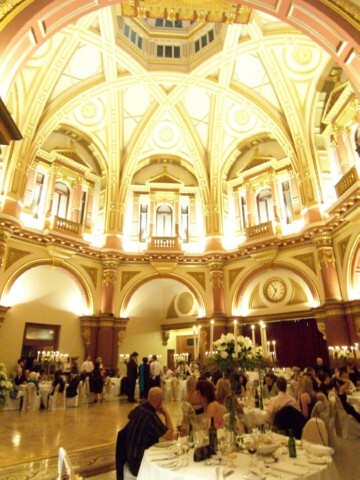 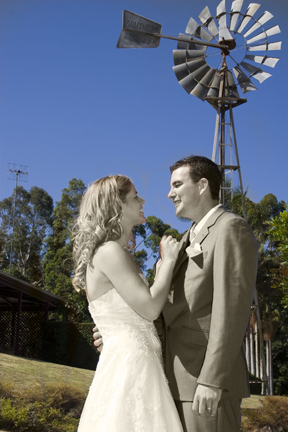 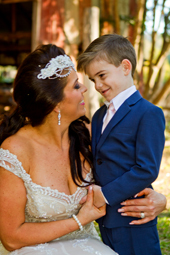 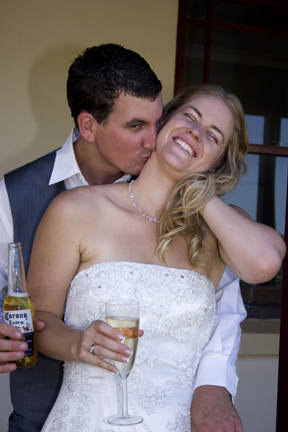 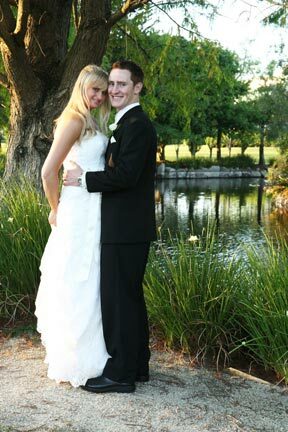 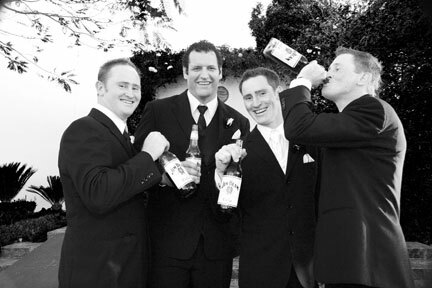 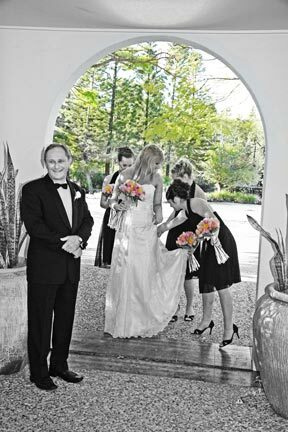 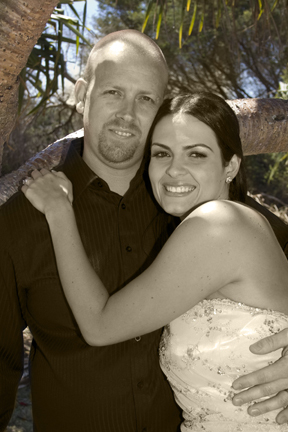 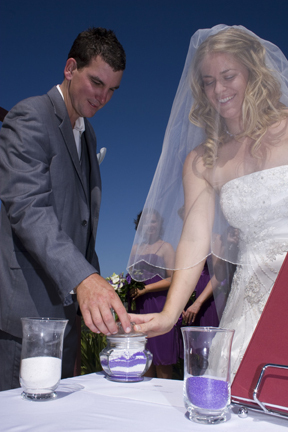 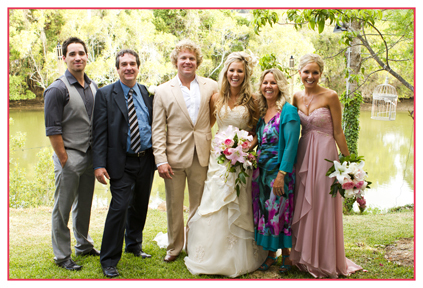 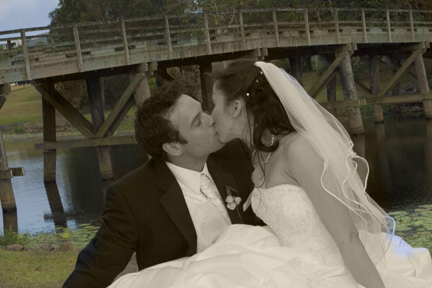 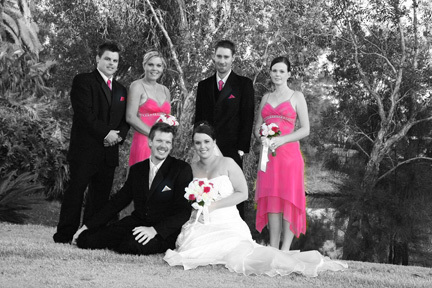 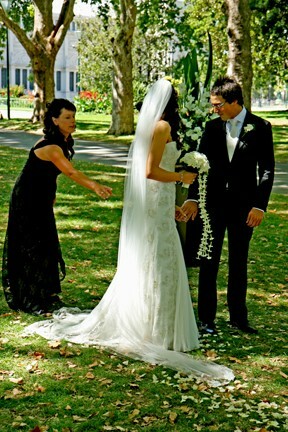 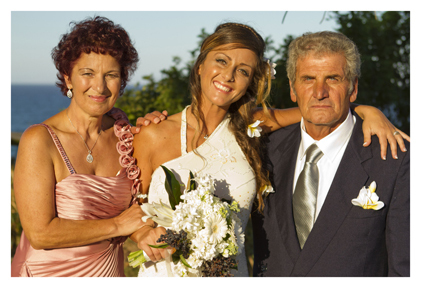 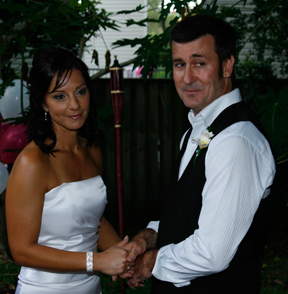 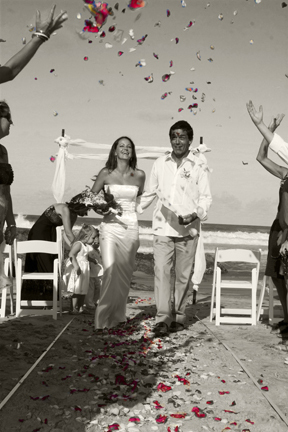 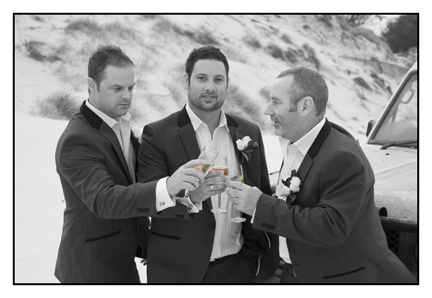 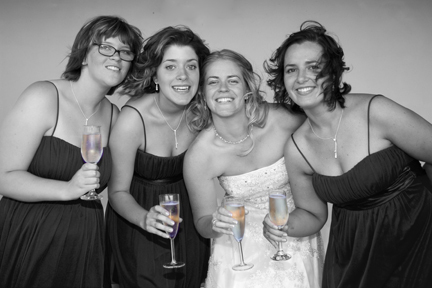 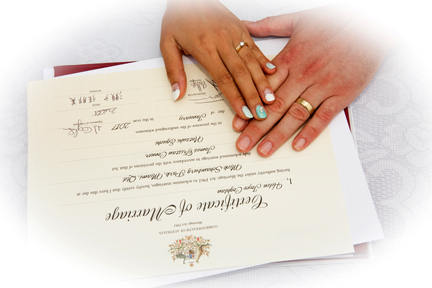 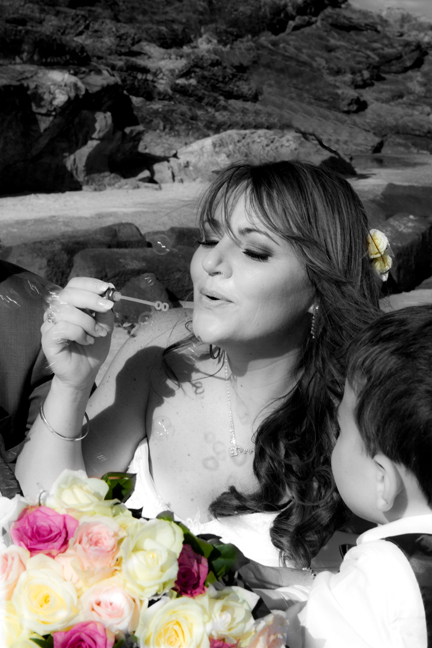 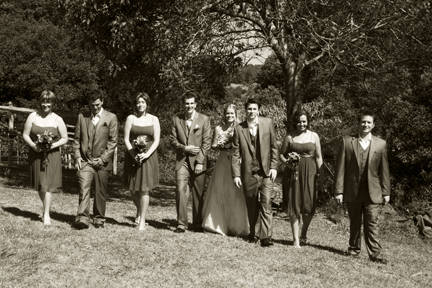 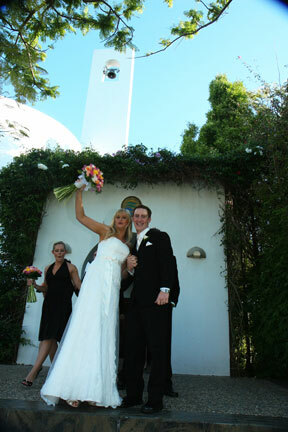 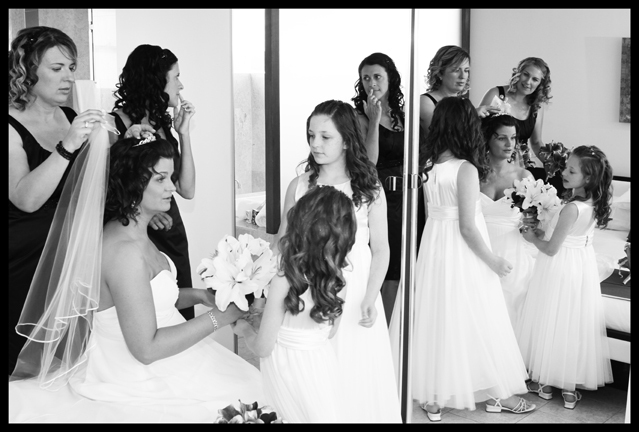 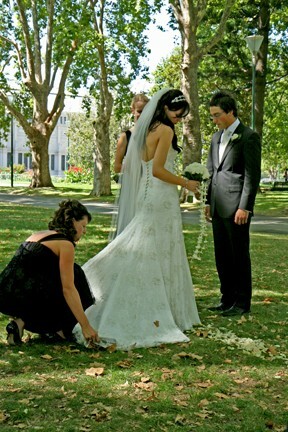 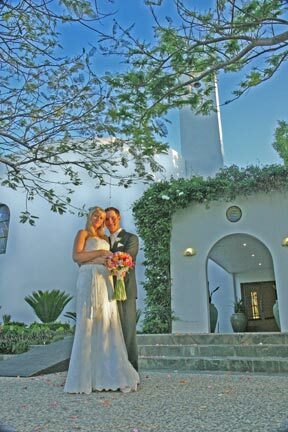 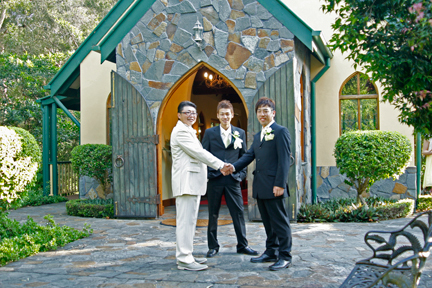 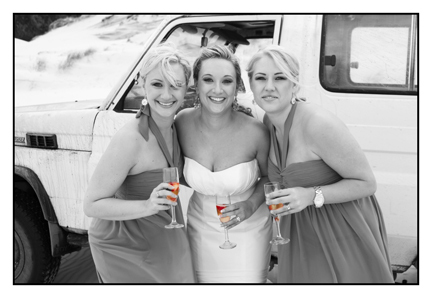 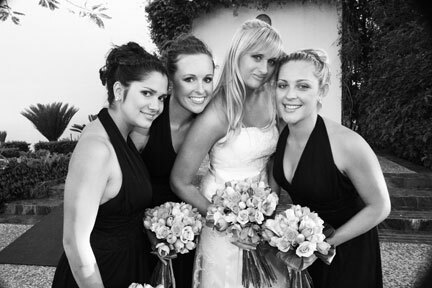 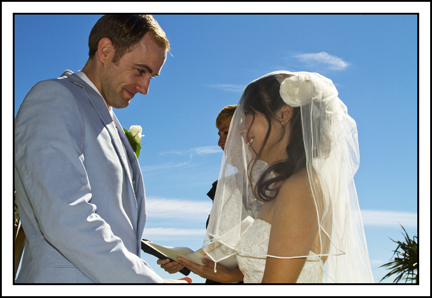 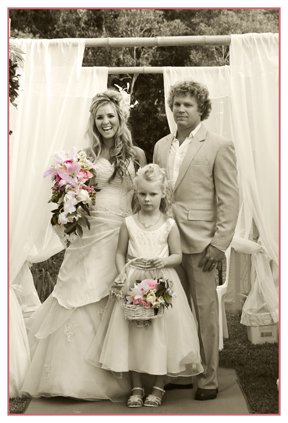 This works for me, I have a lot of experience and you do not have to sweat the small stuff when it comes to the photos. 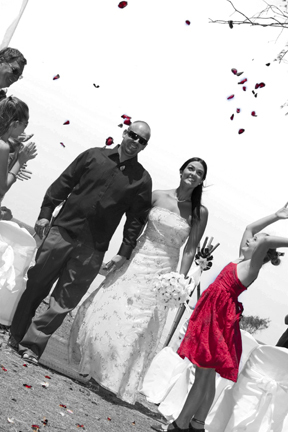 I am quick thinking, and able to improvise with what ever is thrown at me. 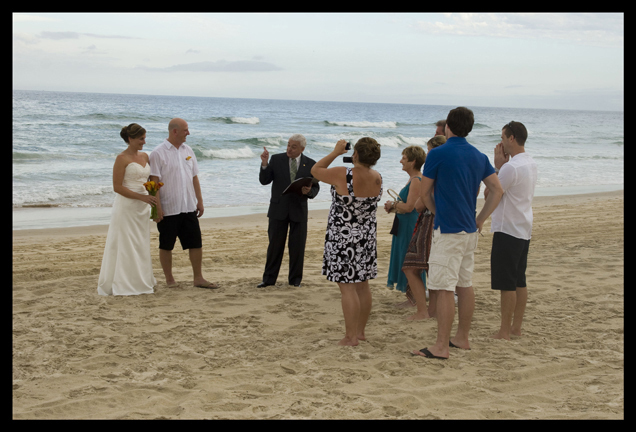 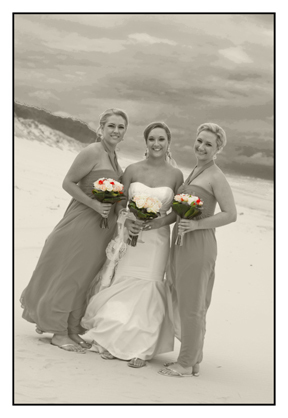 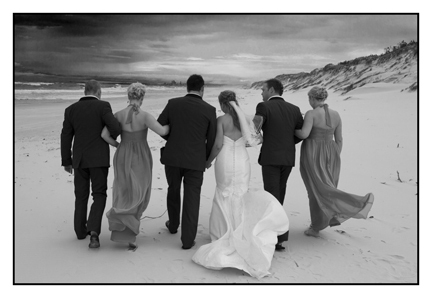 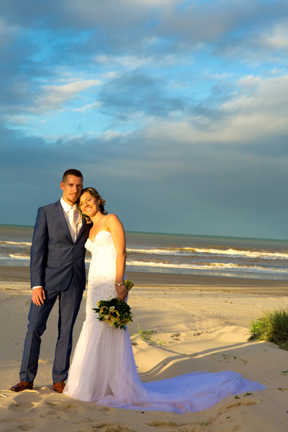 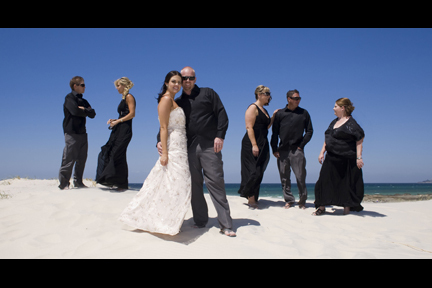 This shoot was my first time at: wedding photography-Stradbroke Island discovering the sand dunes on the Eastern Side of the Island. 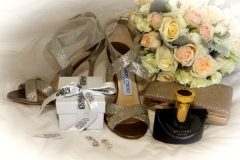 These are a photographers paradise, but you will want to leave the heels behind! 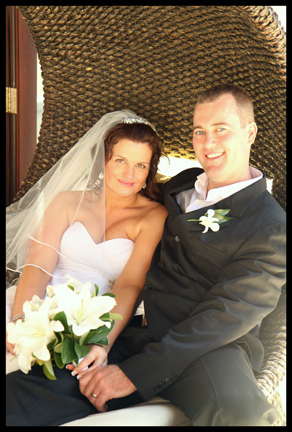 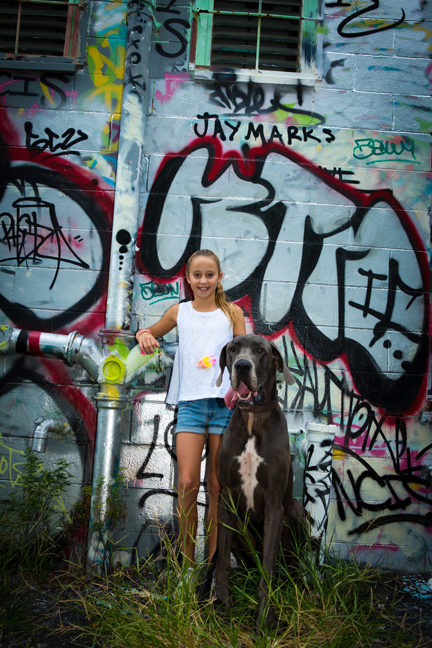 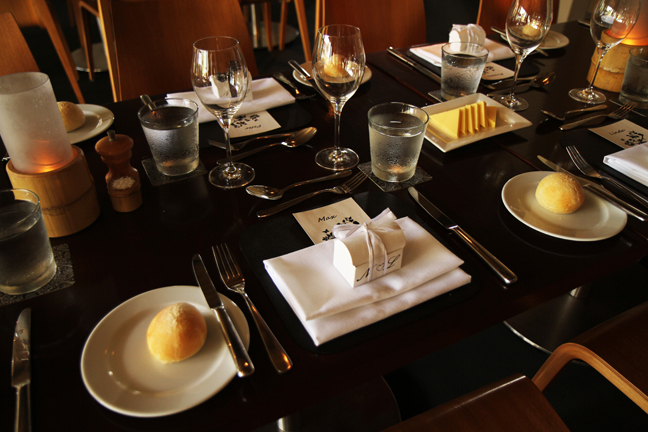 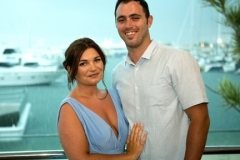 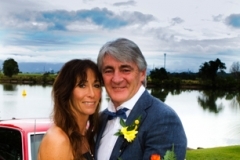 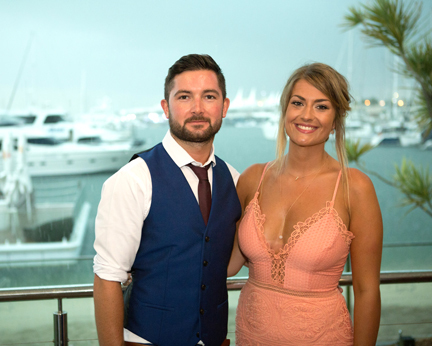 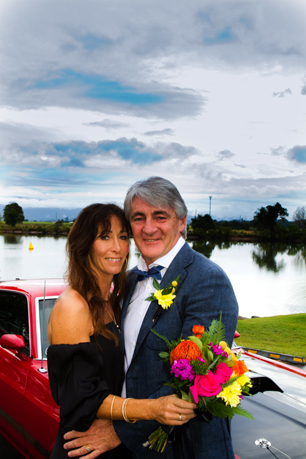 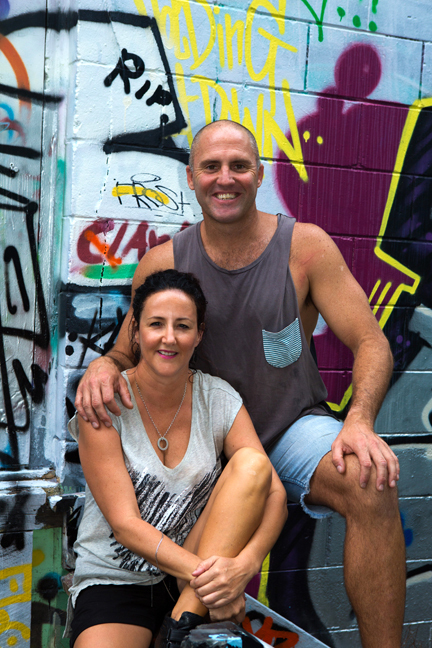 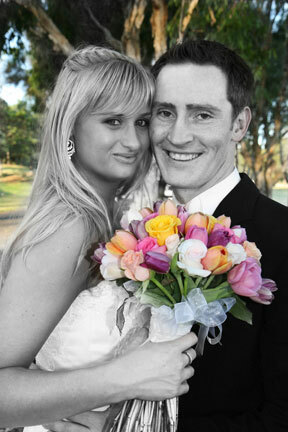 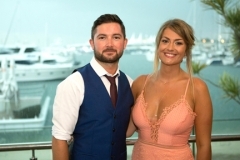 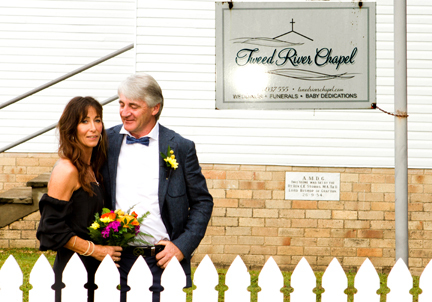 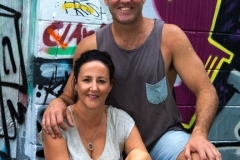 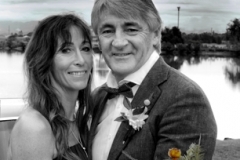 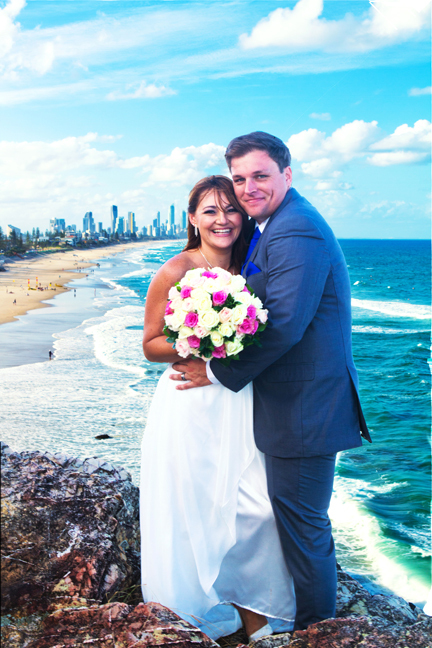 Felicity and Mark, are a fun and truly beautiful local Gold Coast couple destined to meet each other. 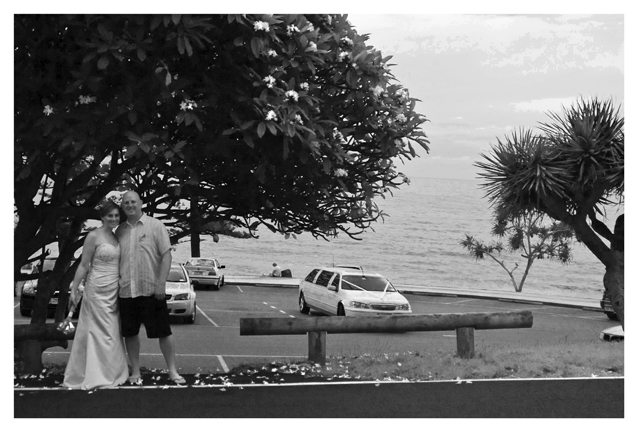 This was quite a long day. 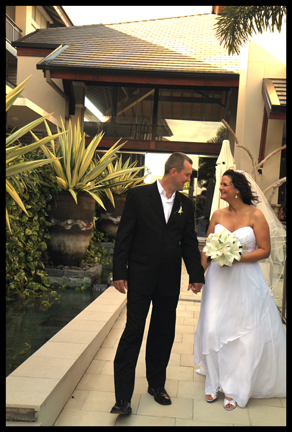 We started at Sheraton Mirage. 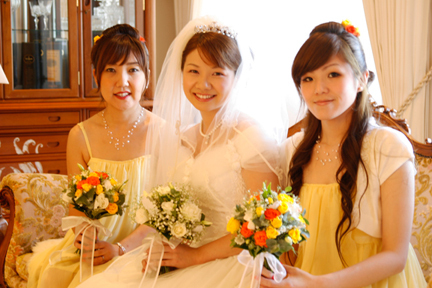 The next stage was at Marina Mirage. 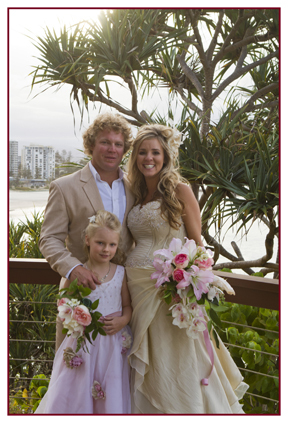 Next, boarding boats to travel to Stradbroke Island whilst keeping Felicity and Mark from seeing each other. 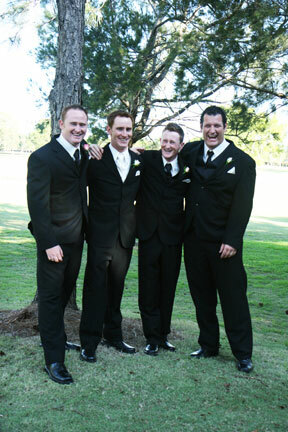 Mark and the groomsmen boarded a very fast speed boat and were out of there in no time. 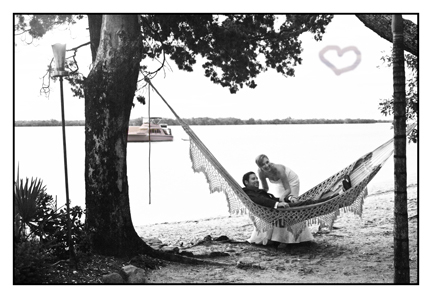 Felicity, the girls and her parents had some more cover on their boat and the 40 minutes to McClarens Landing was a very pleasurable trip. 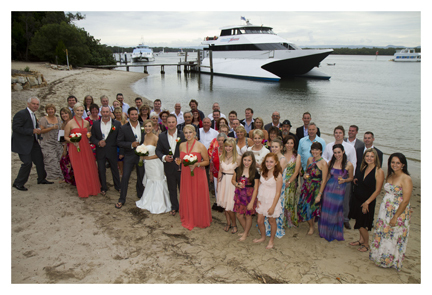 The guests arrived on another big boat, ready for a 3pm Ceremony. They travelled in real style! 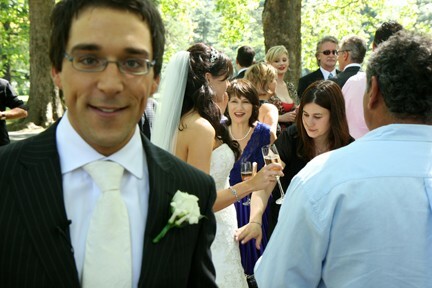 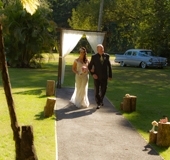 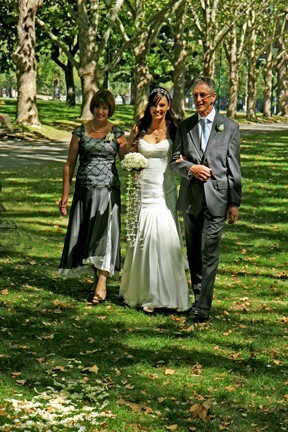 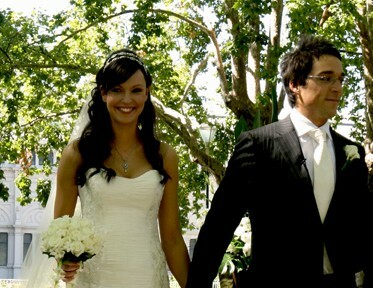 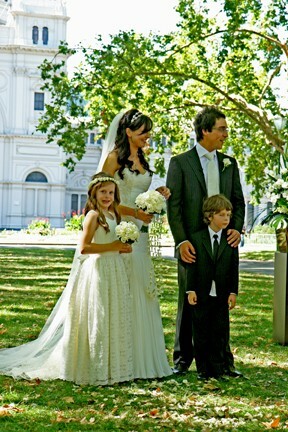 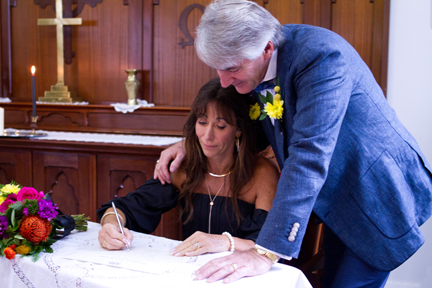 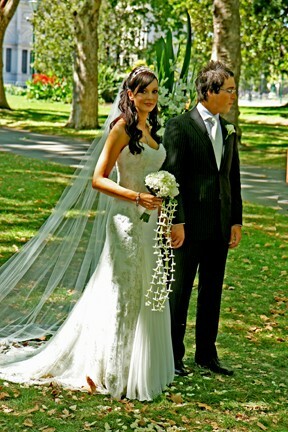 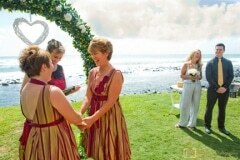 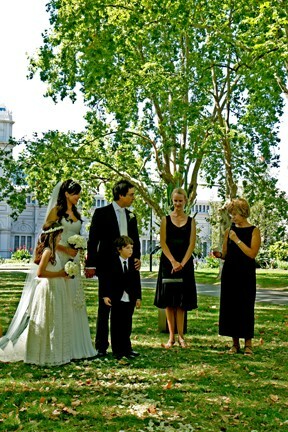 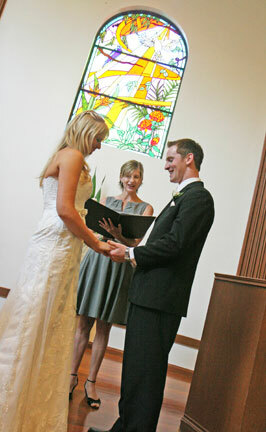 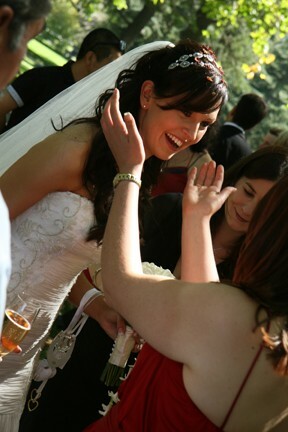 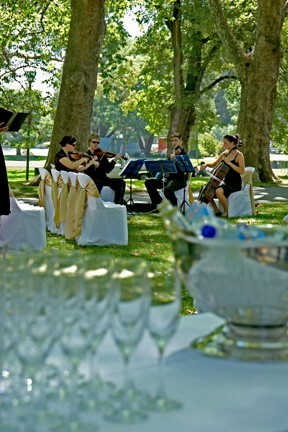 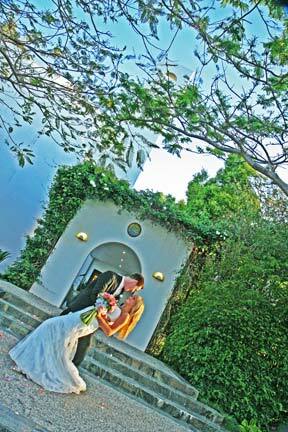 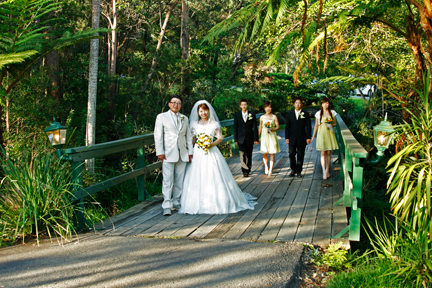 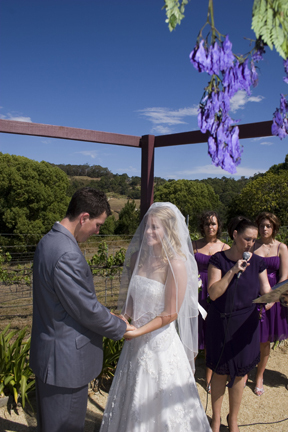 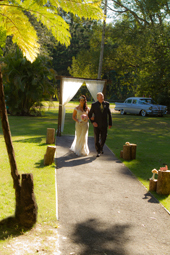 The Ceremony was lovely, with the sun streaming through the trees and the water sparkling. 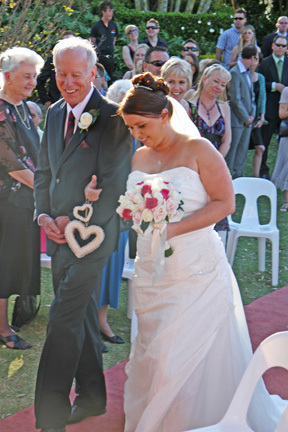 Felicities dad walked her down the aisle, later Marks younger sister sung a song like an angel and you could feel the love in the air. Two very nice families in unity. 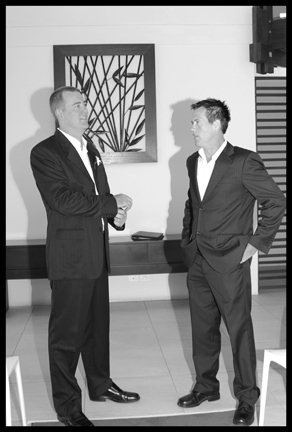 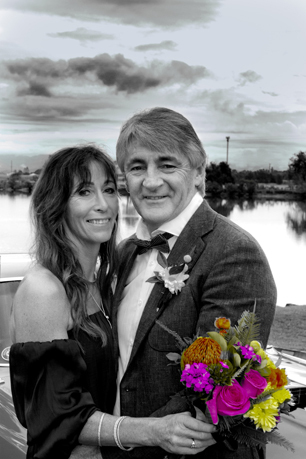 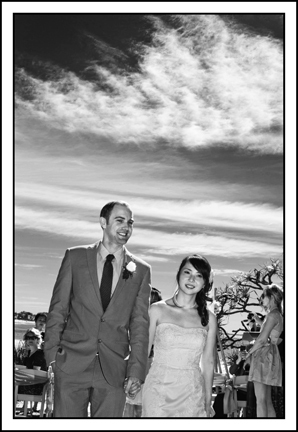 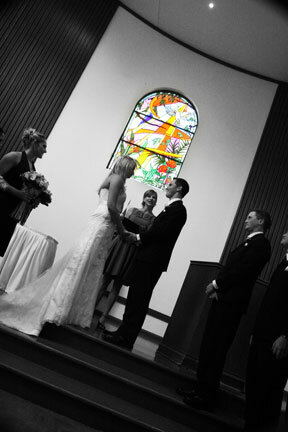 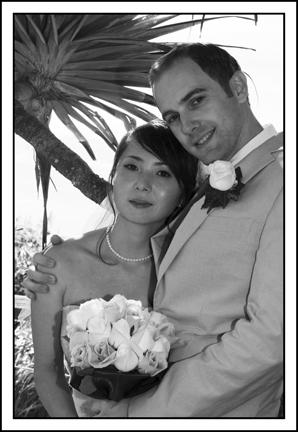 As Felicity and Mark love black and white photos, .I did up quite a few of these in the editing. 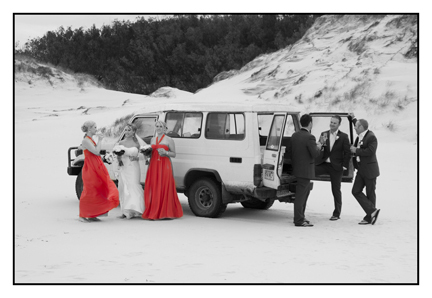 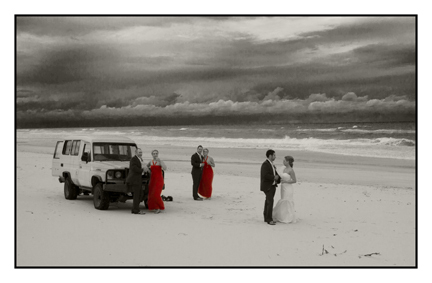 Also black and white with splashes of colour, which really highlighted the sunset beach photos with the old land cruiser. 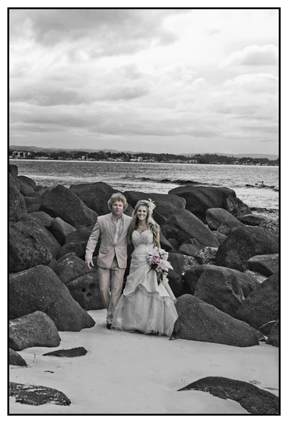 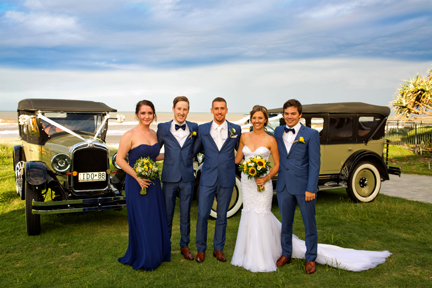 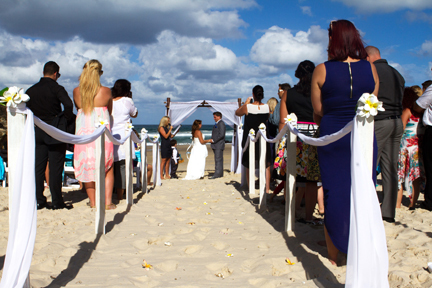 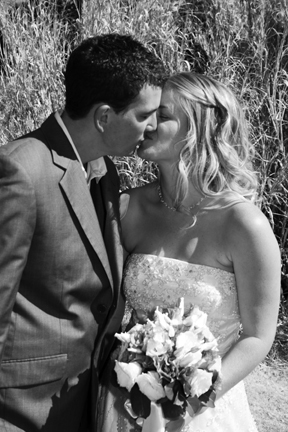 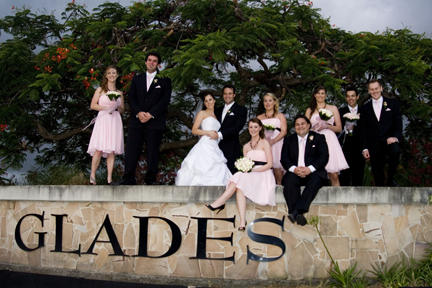 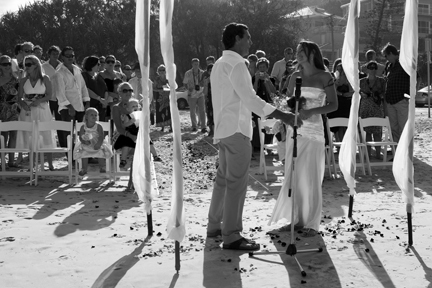 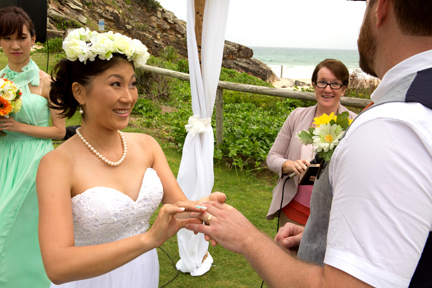 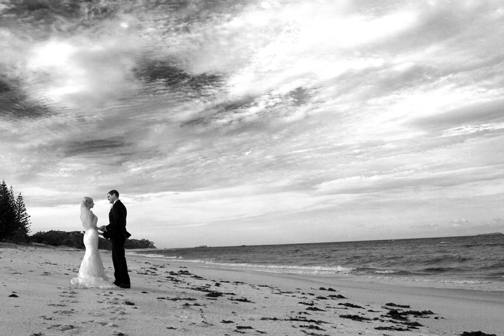 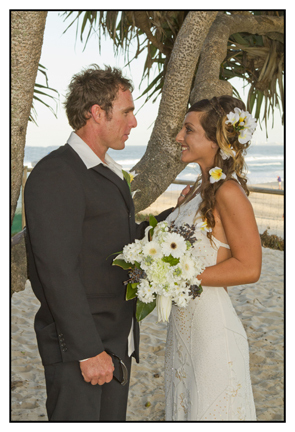 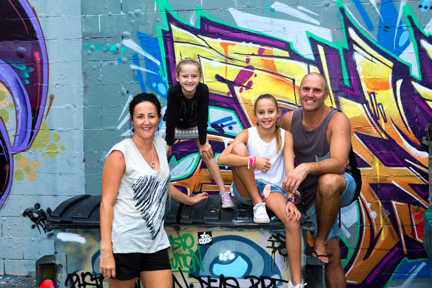 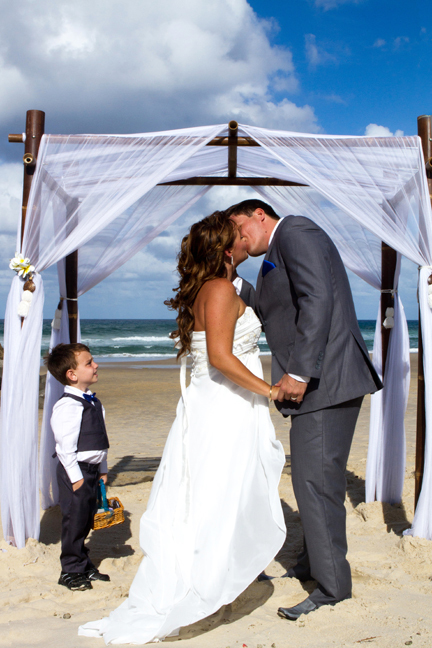 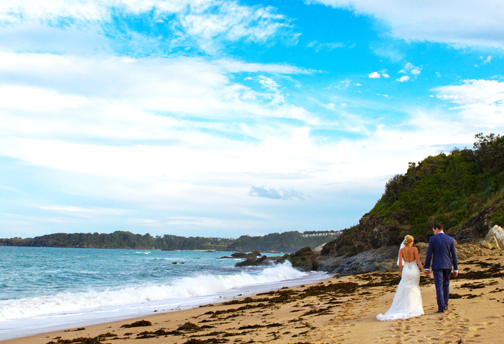 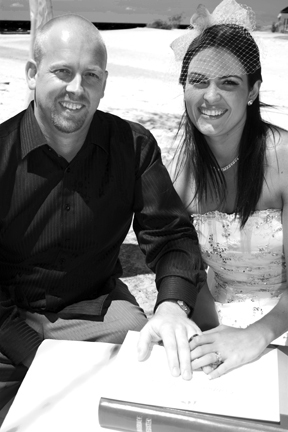 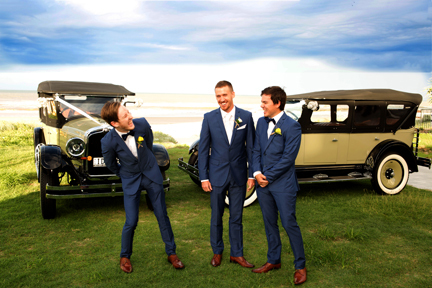 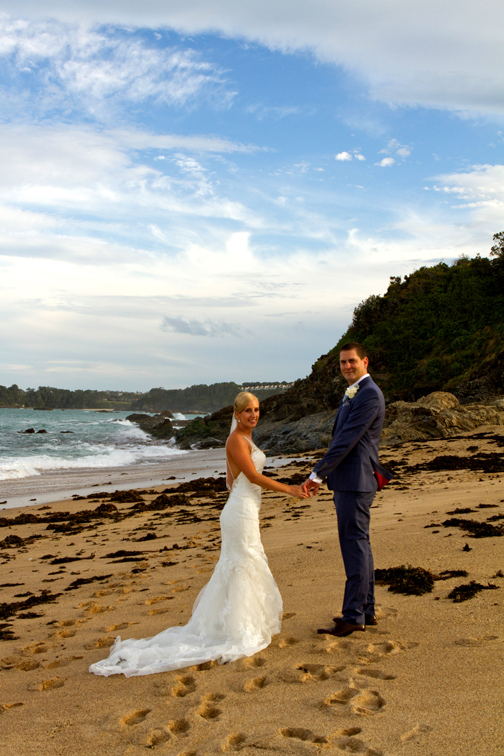 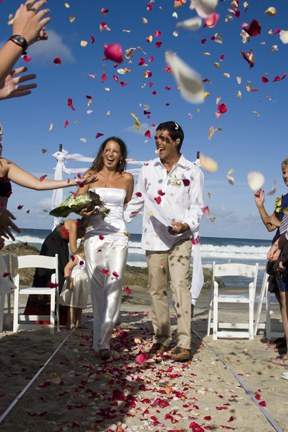 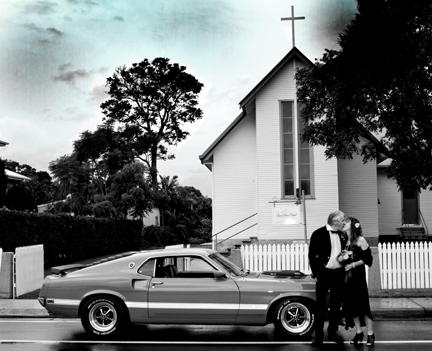 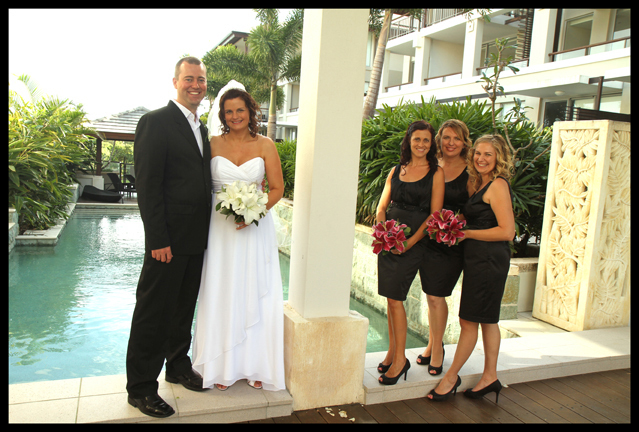 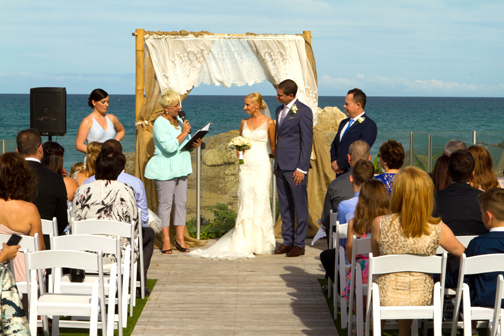 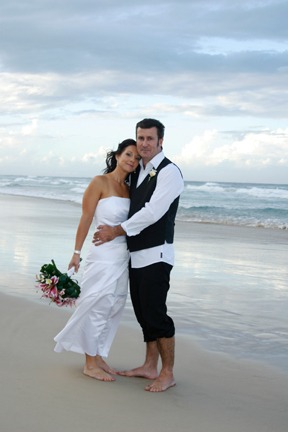 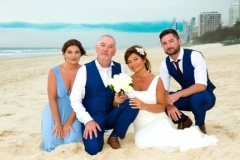 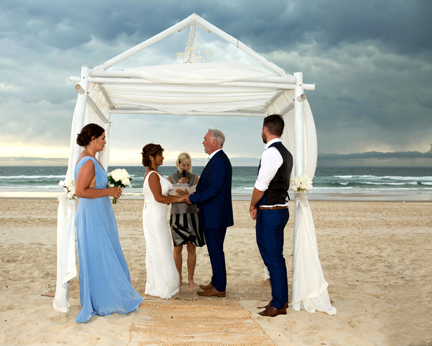 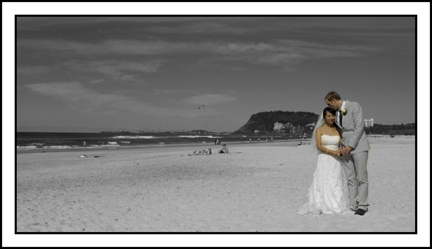 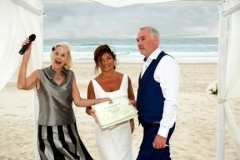 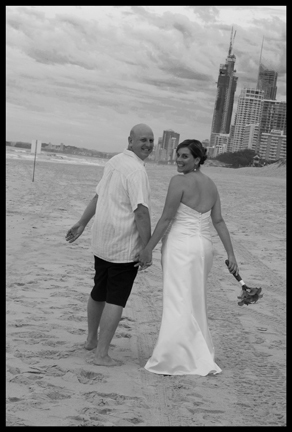 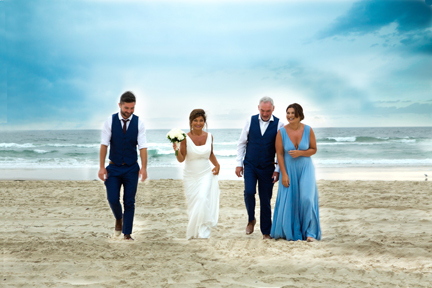 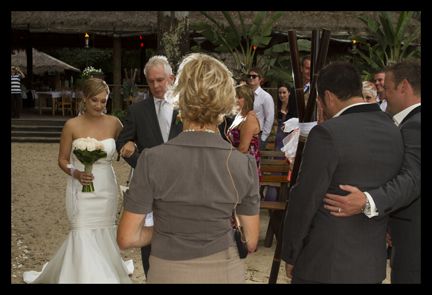 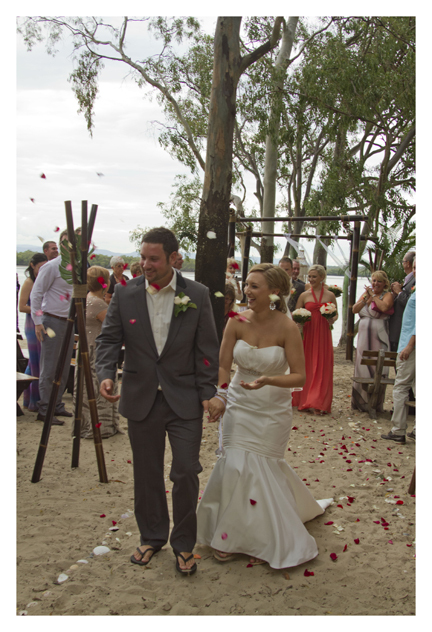 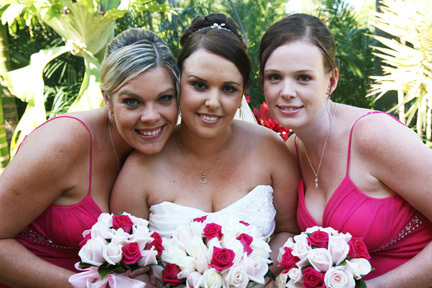 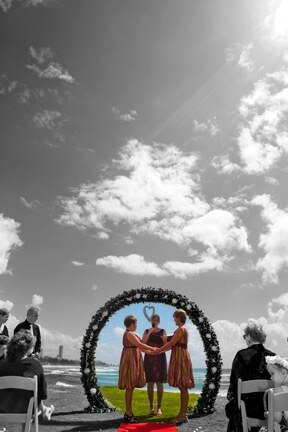 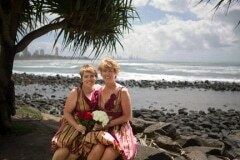 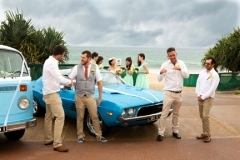 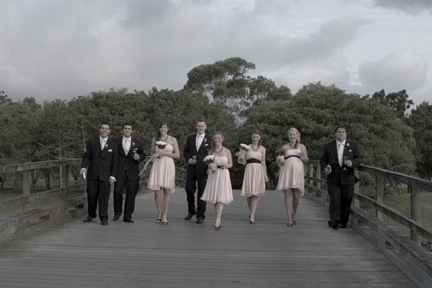 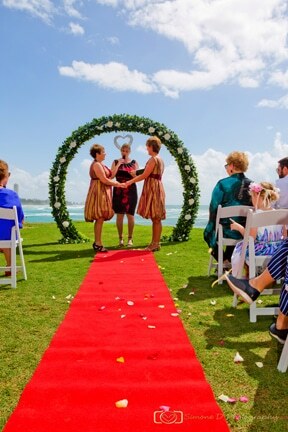 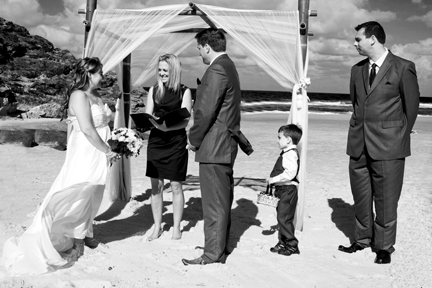 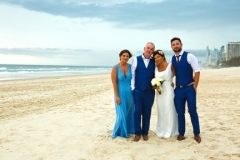 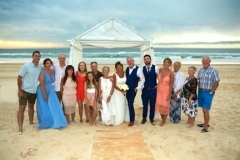 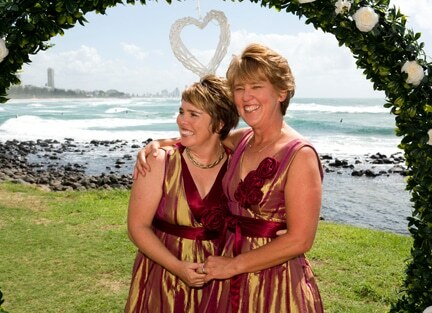 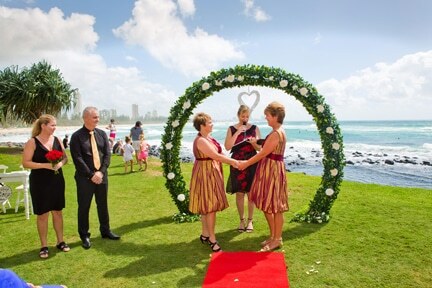 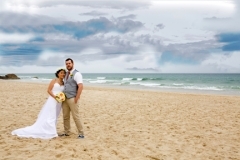 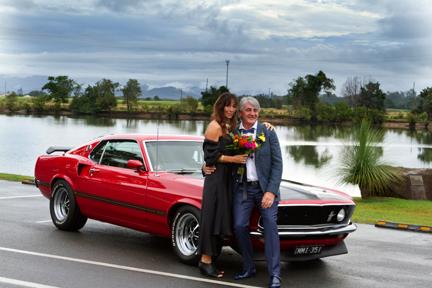 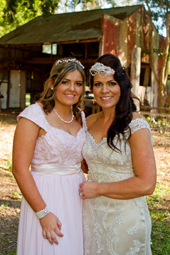 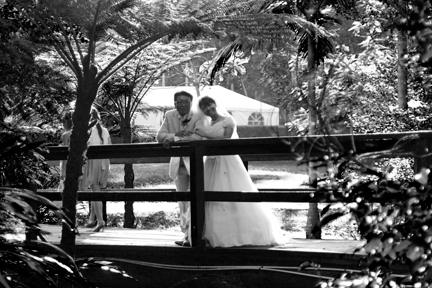 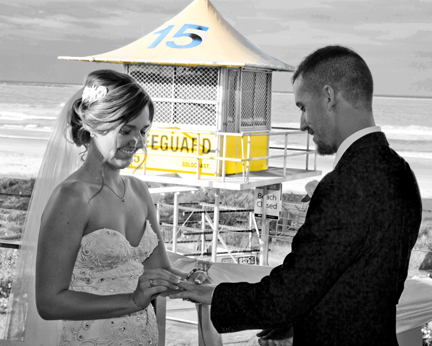 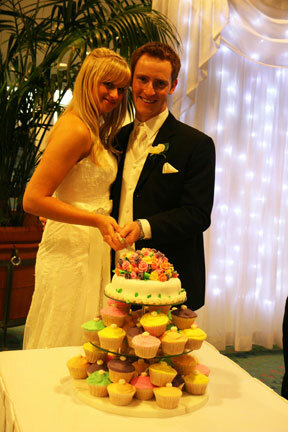 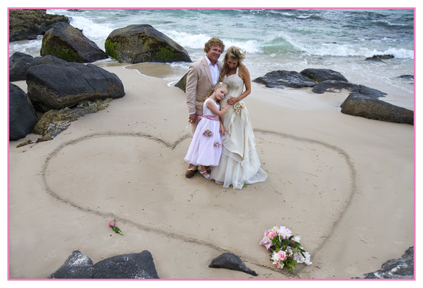 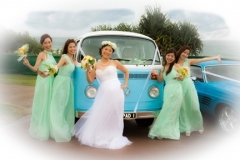 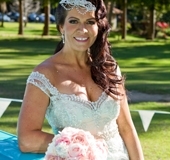 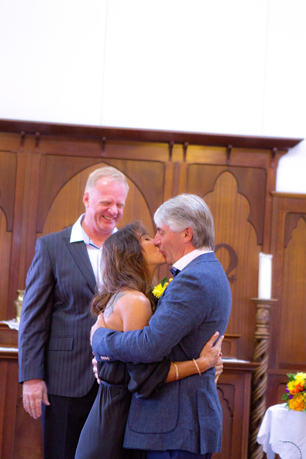 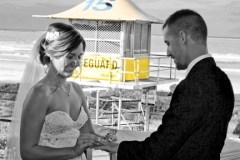 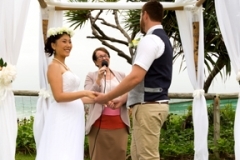 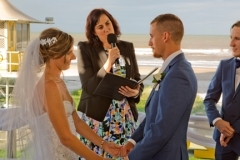 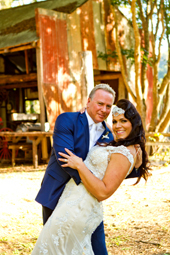 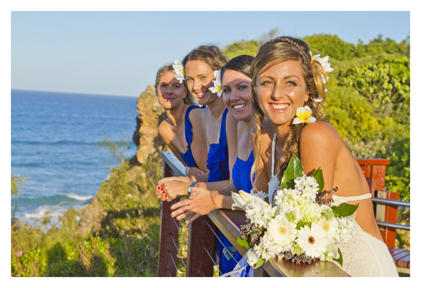 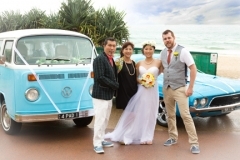 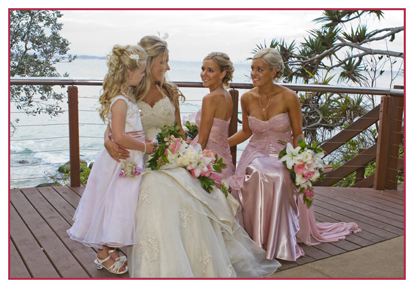 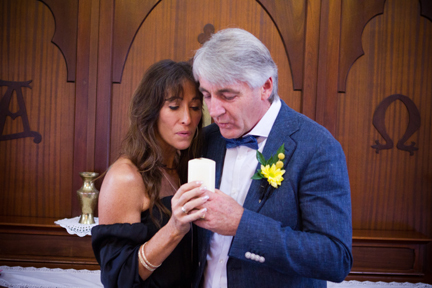 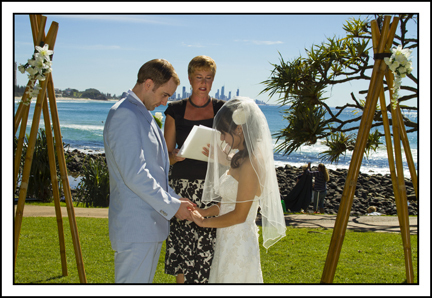 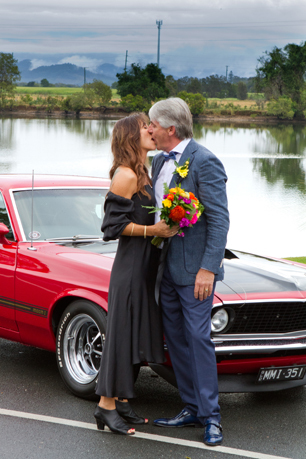 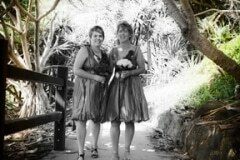 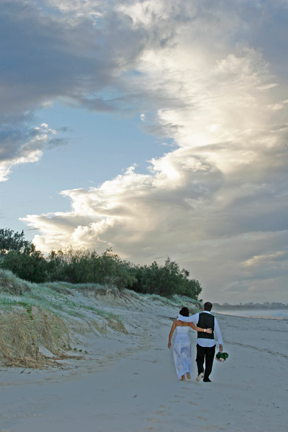 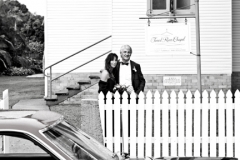 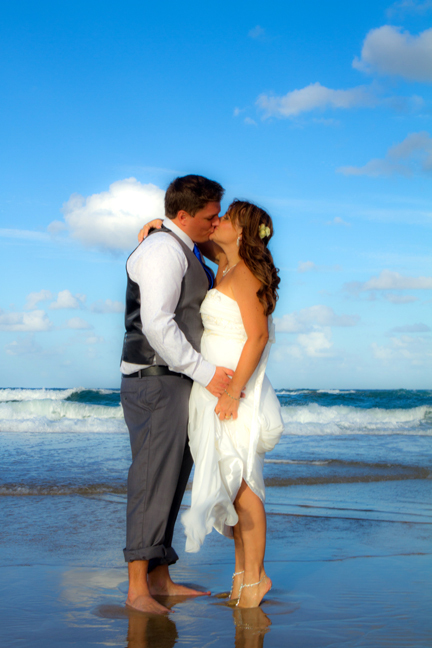 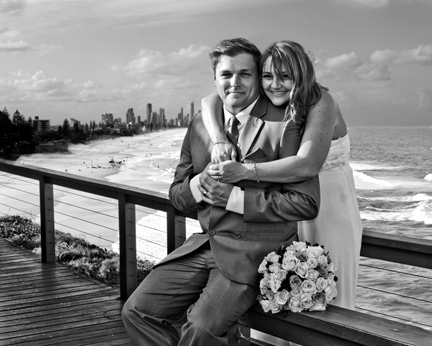 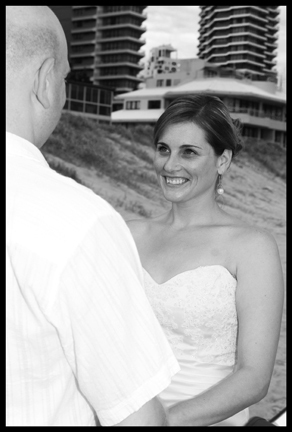 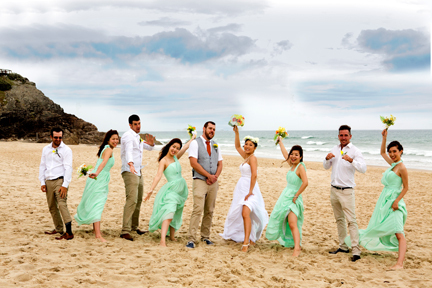 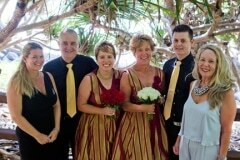 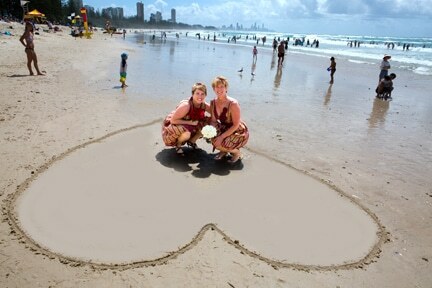 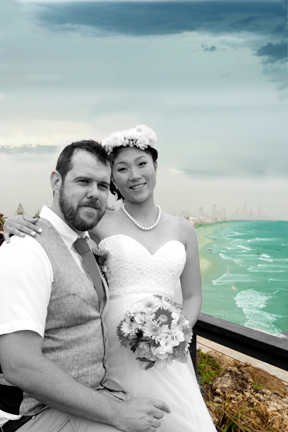 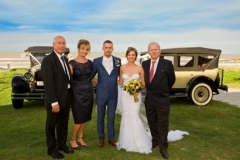 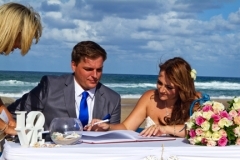 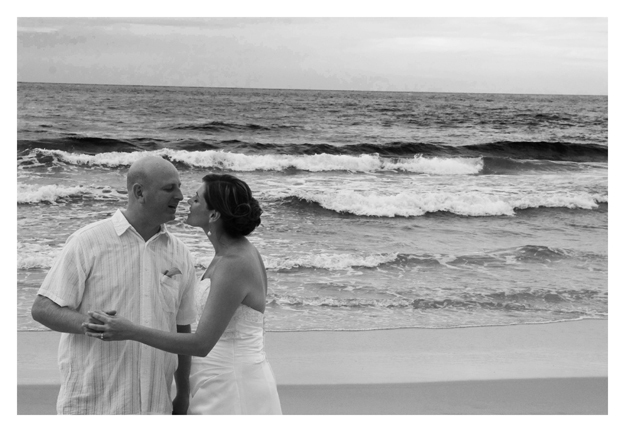 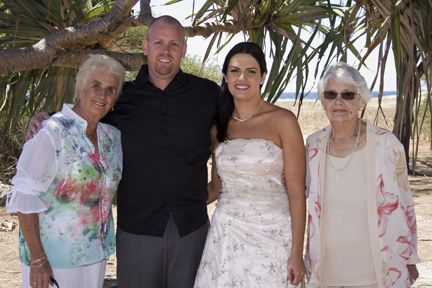 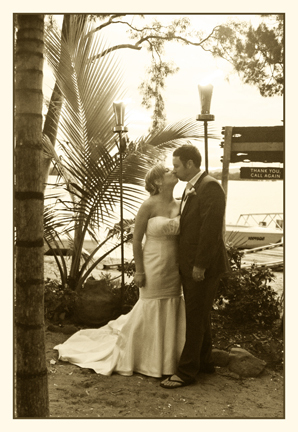 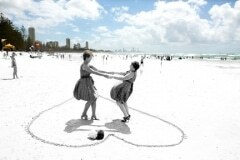 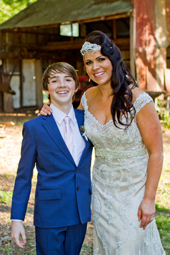 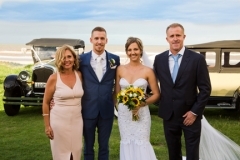 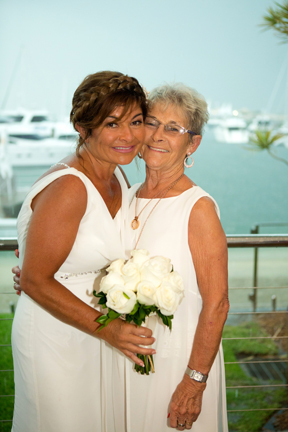 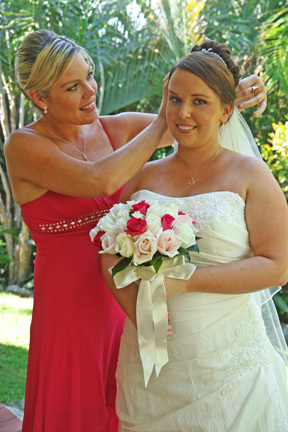 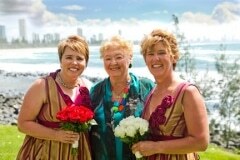 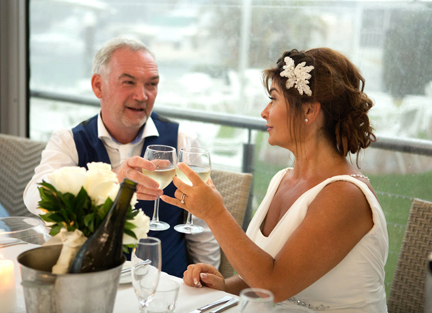 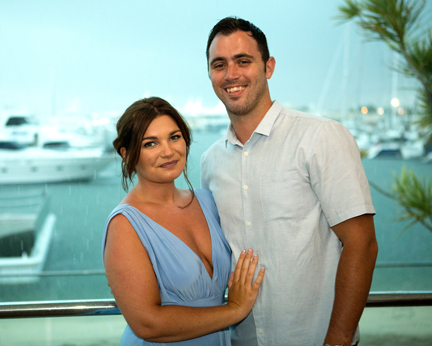 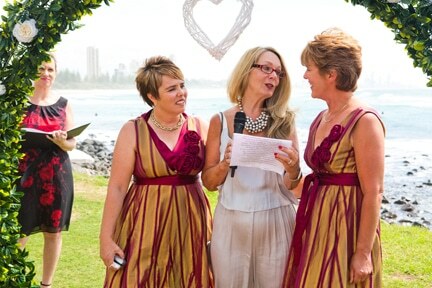 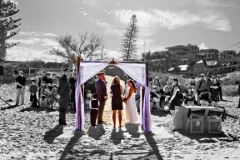 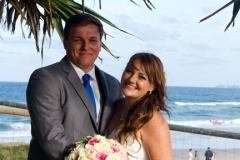 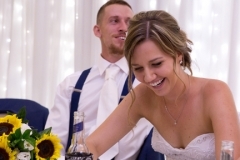 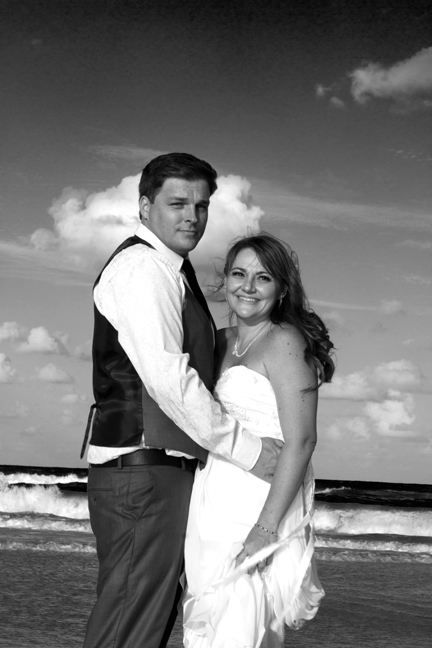 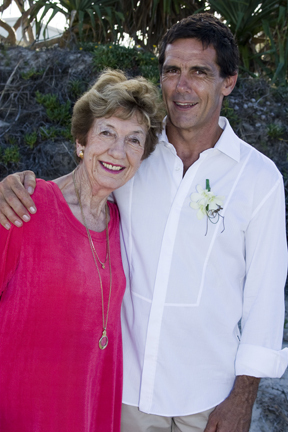 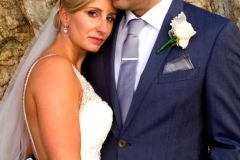 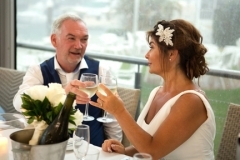 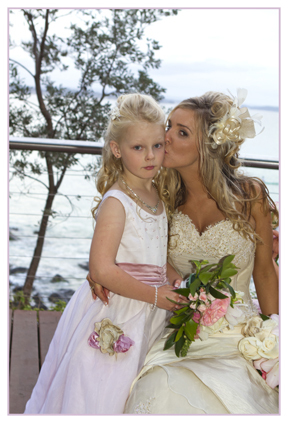 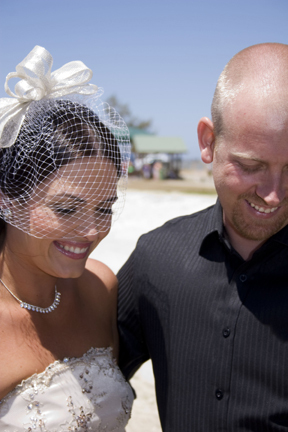 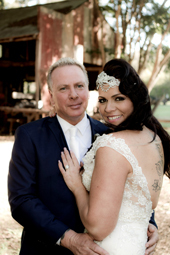 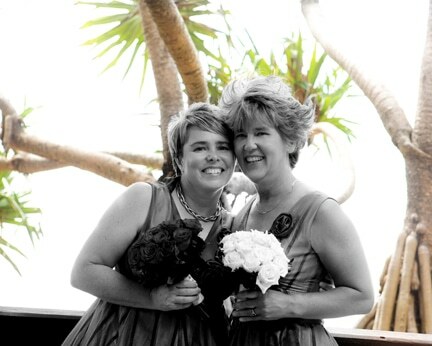 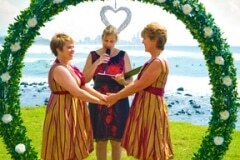 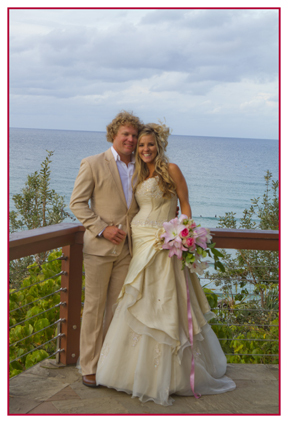 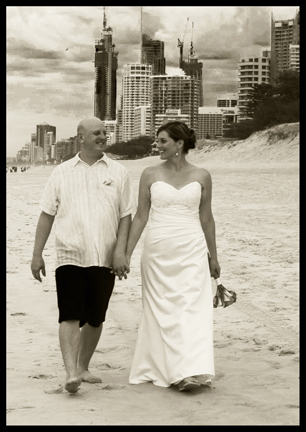 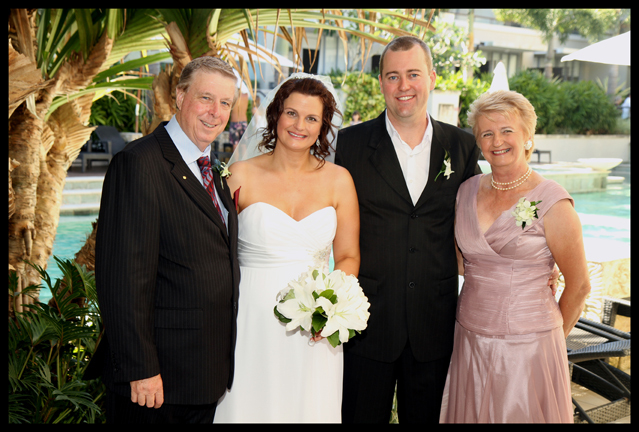 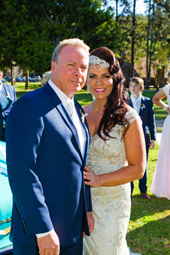 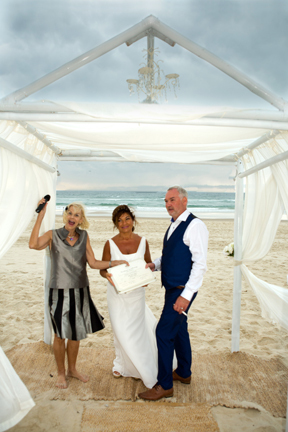 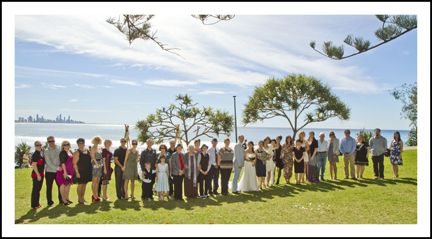 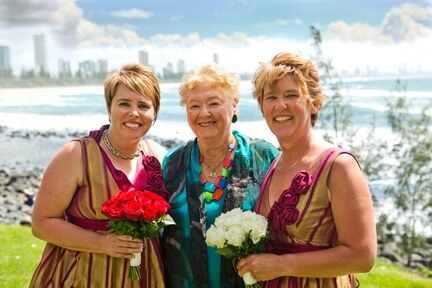 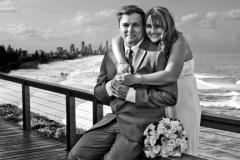 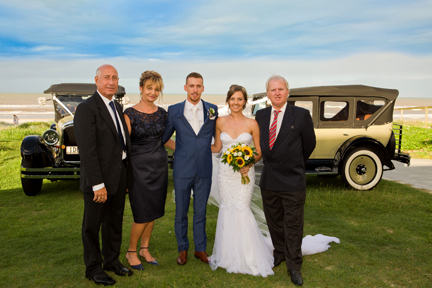 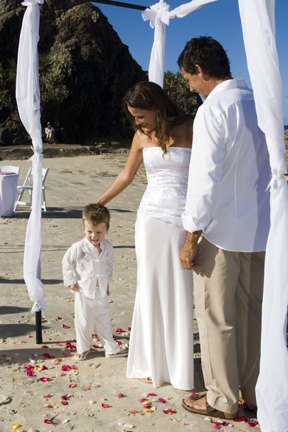 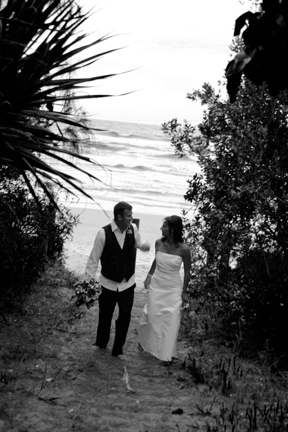 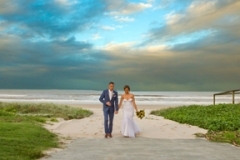 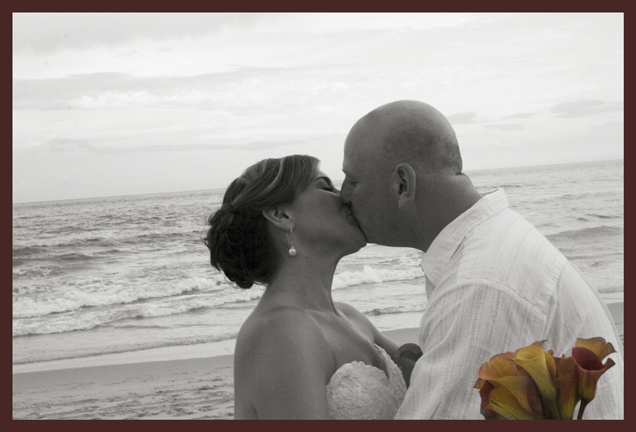 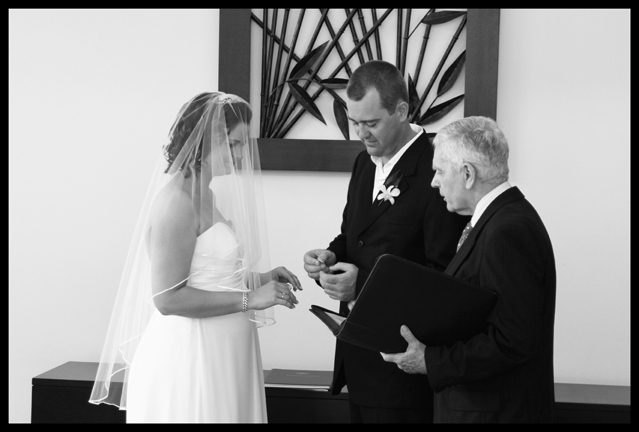 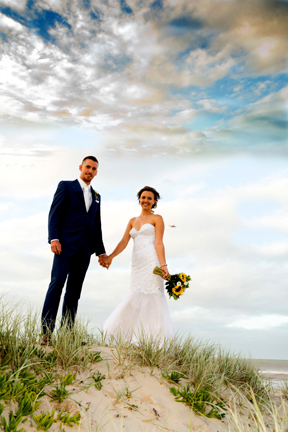 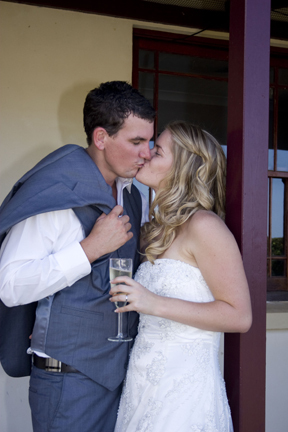 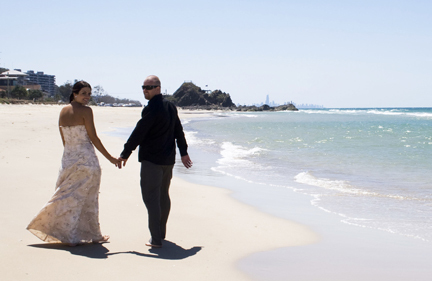 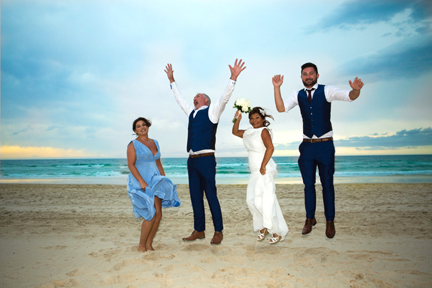 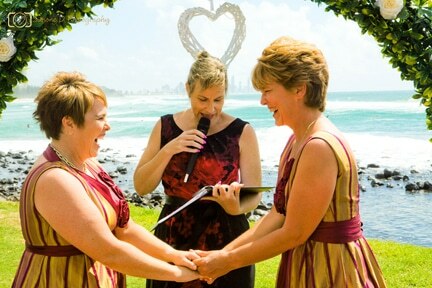 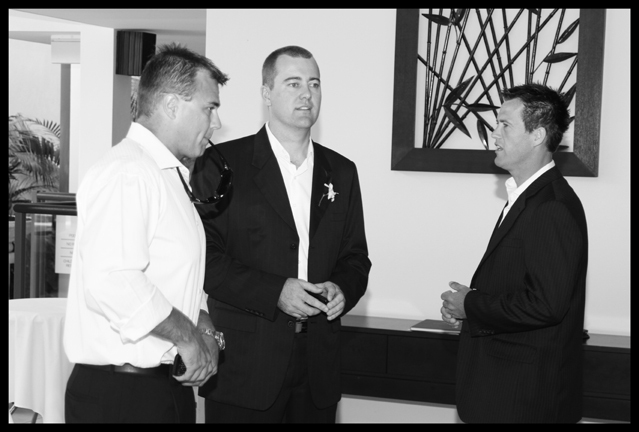 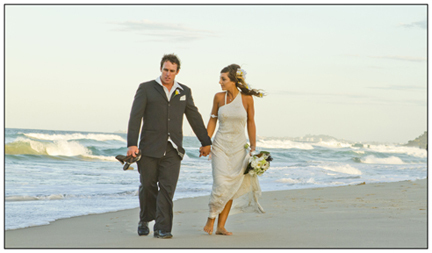 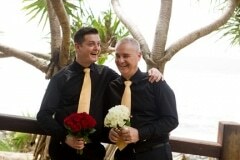 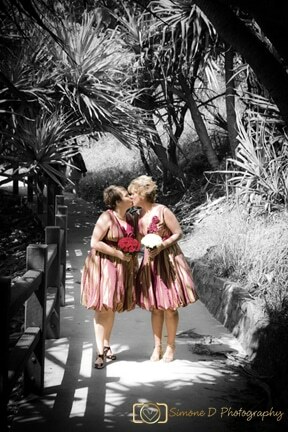 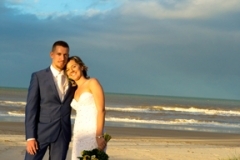 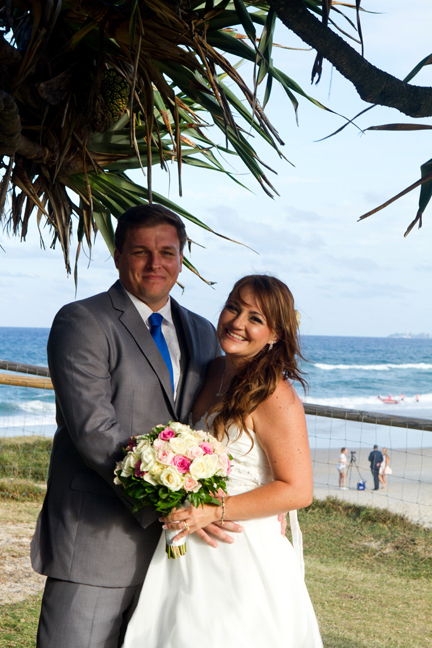 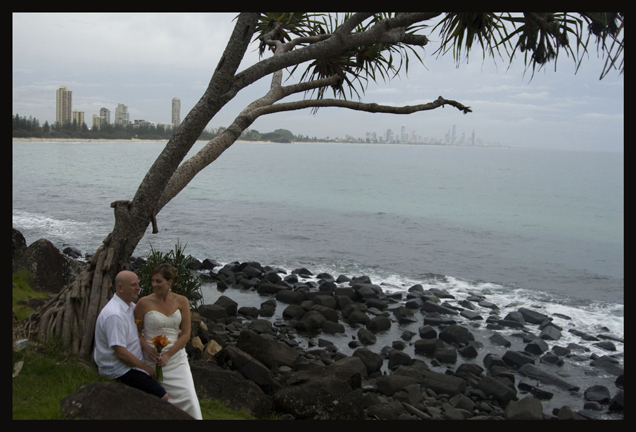 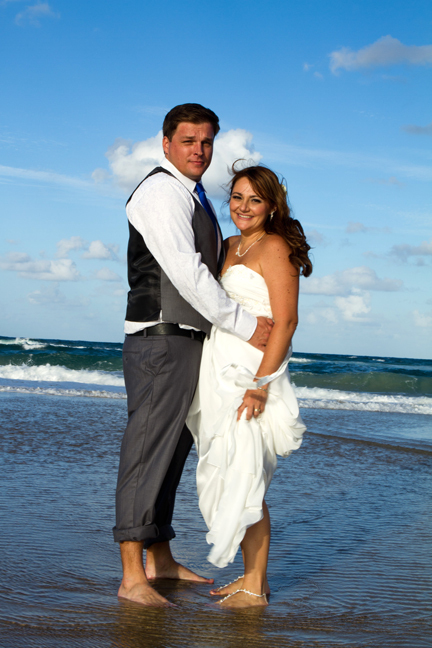 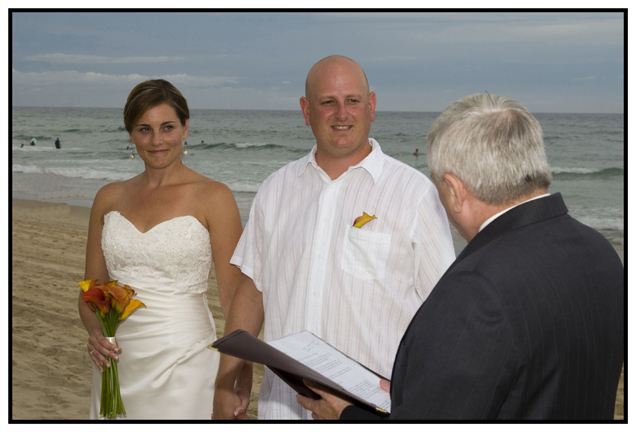 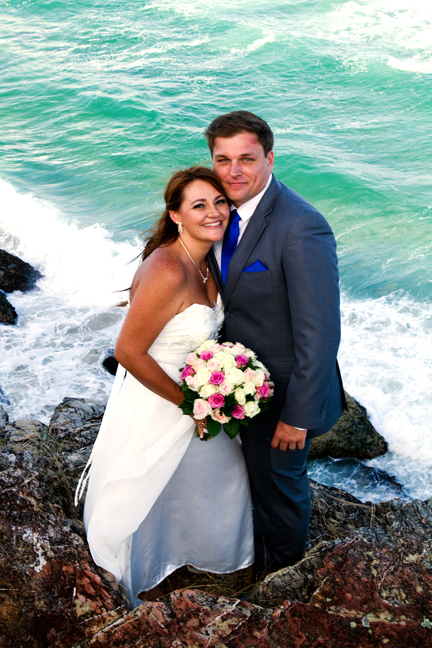 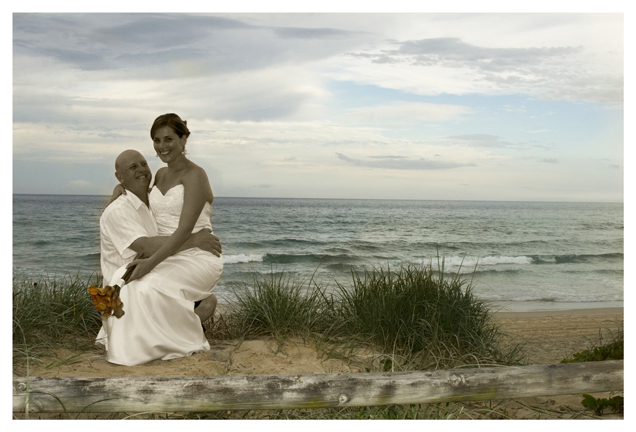 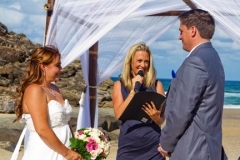 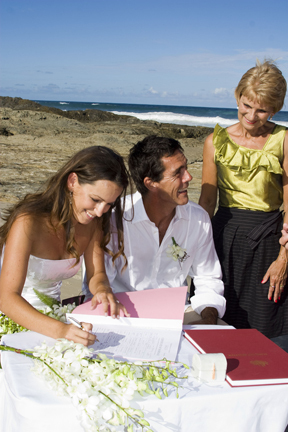 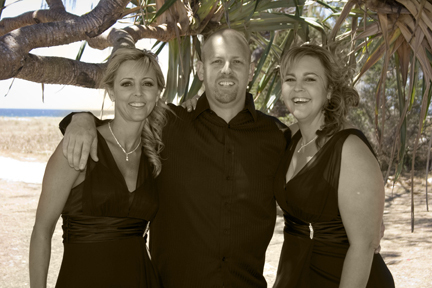 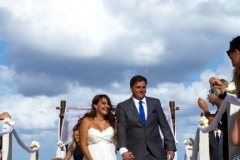 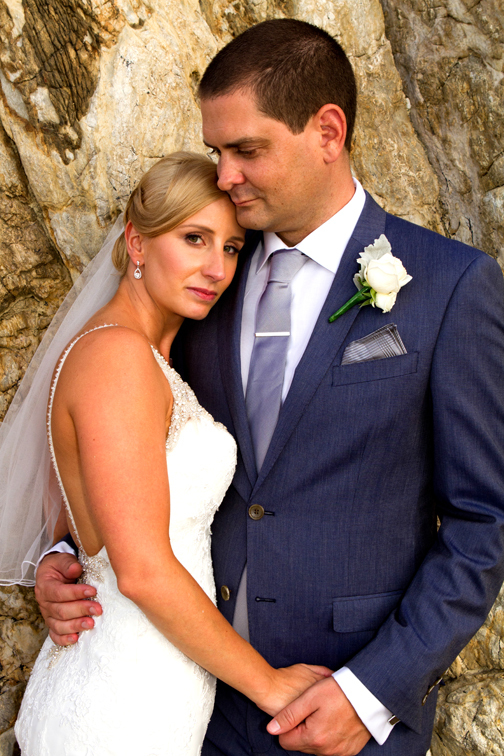 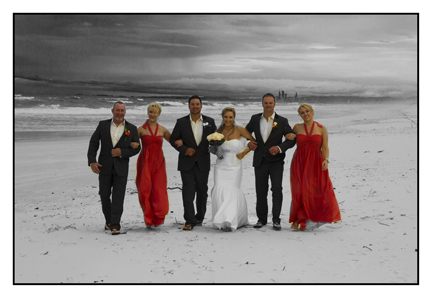 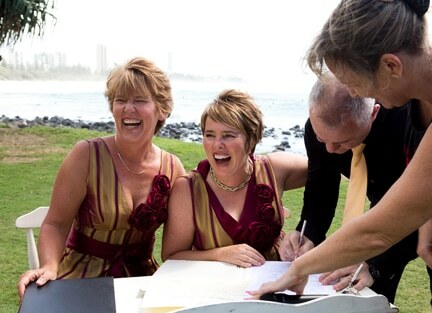 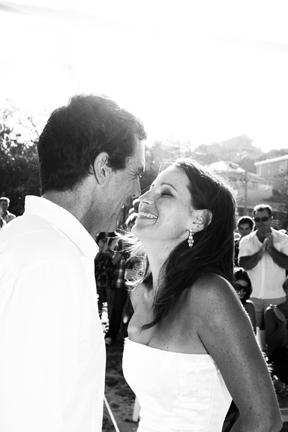 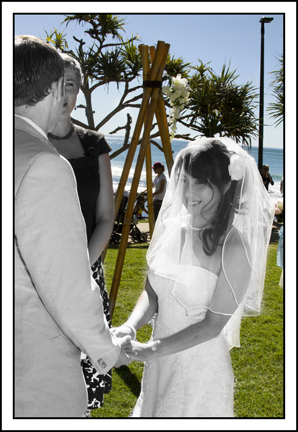 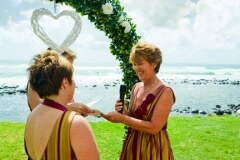 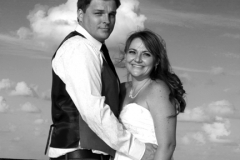 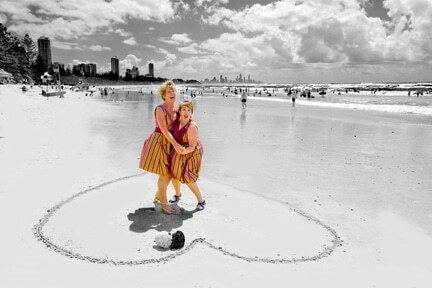 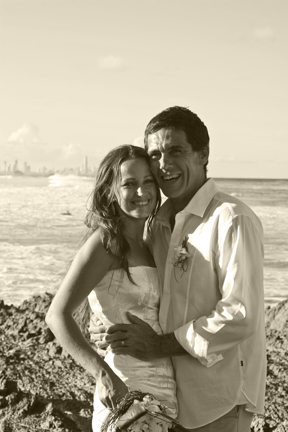 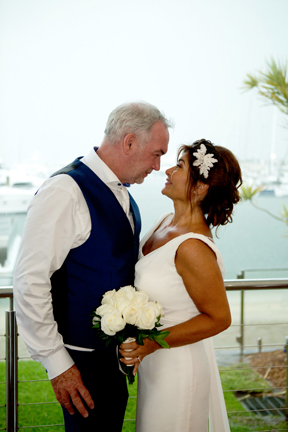 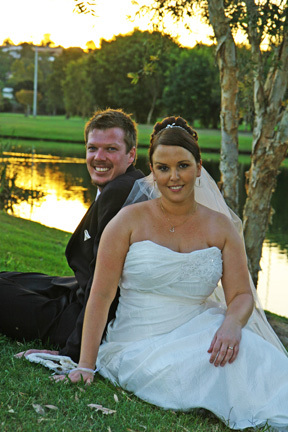 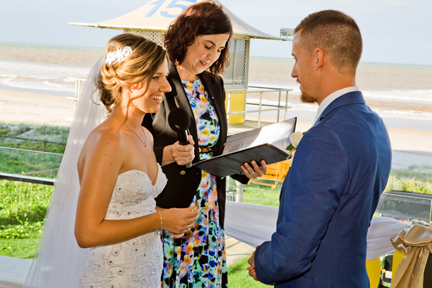 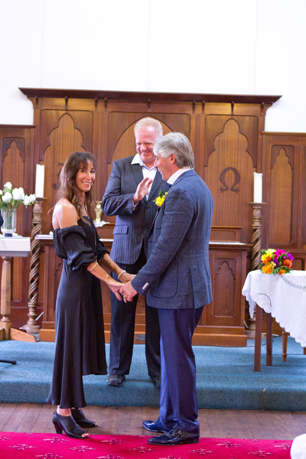 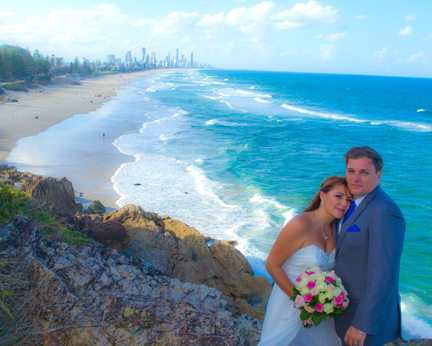 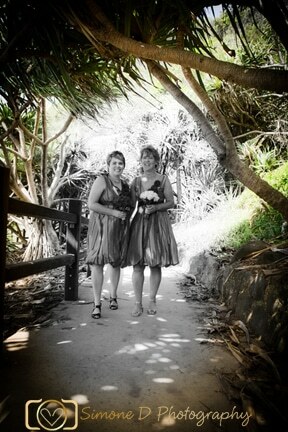 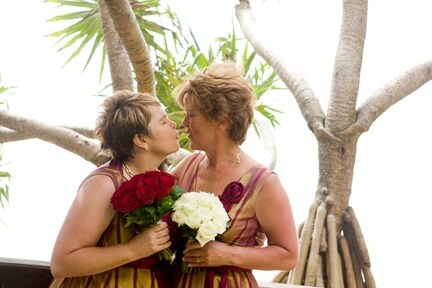 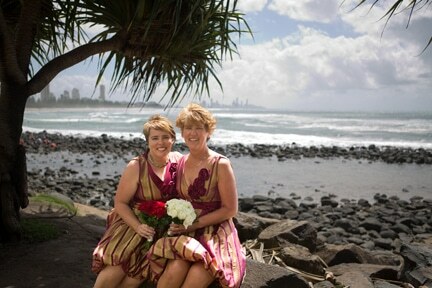 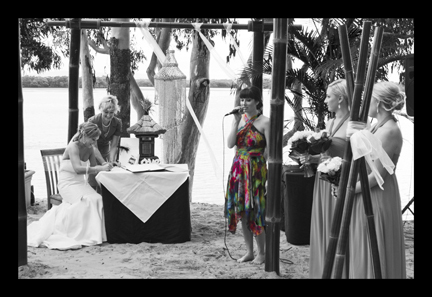 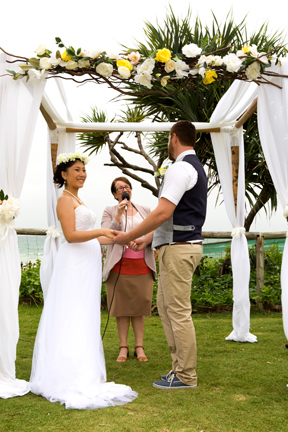 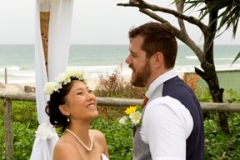 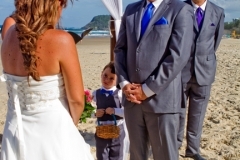 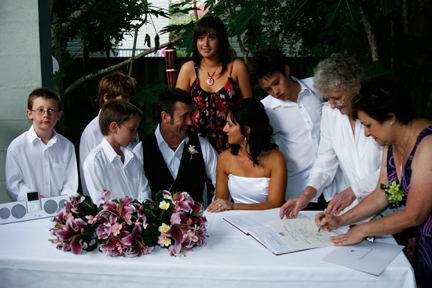 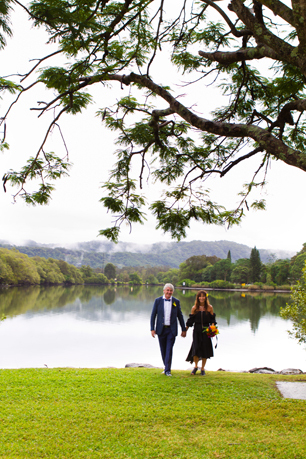 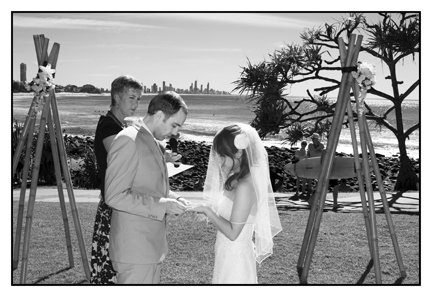 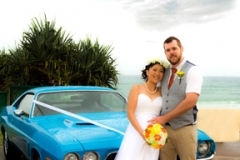 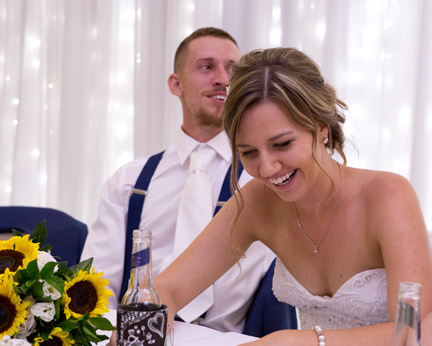 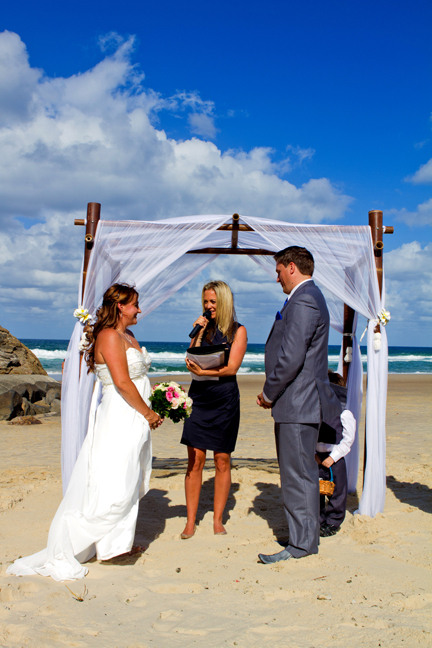 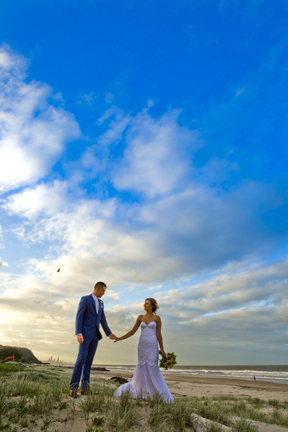 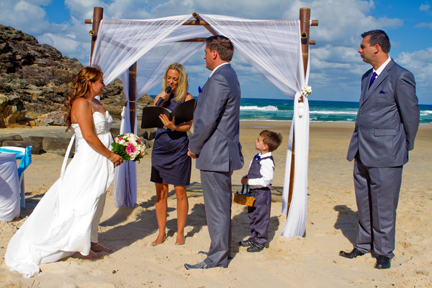 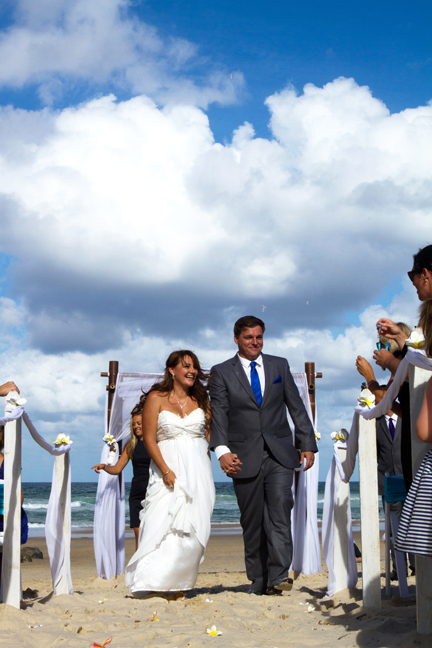 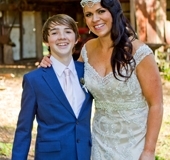 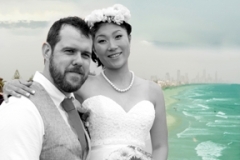 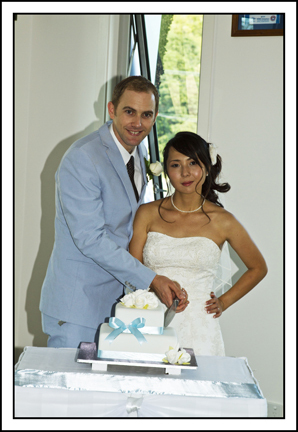 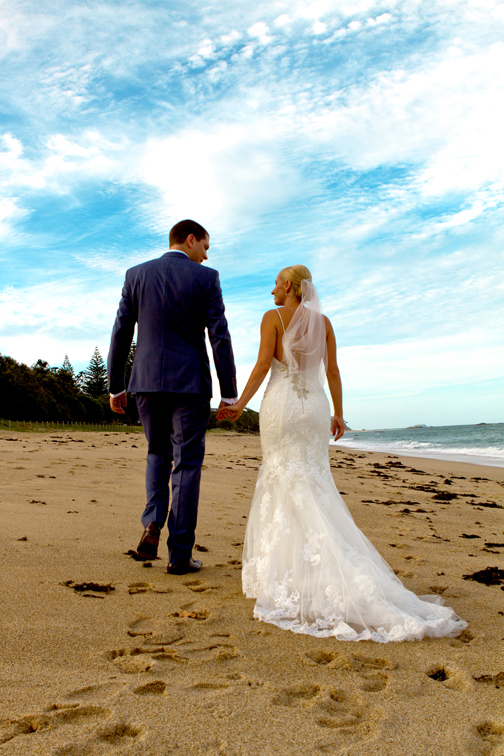 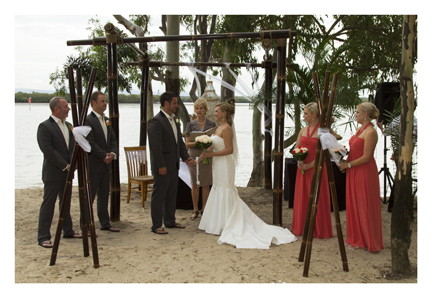 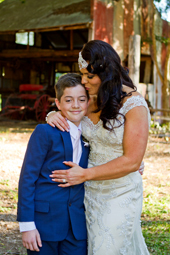 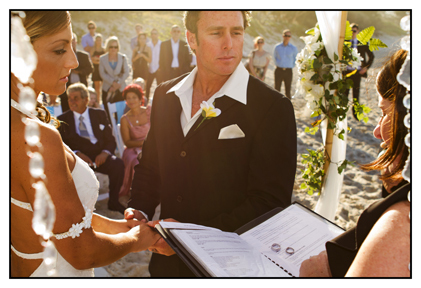 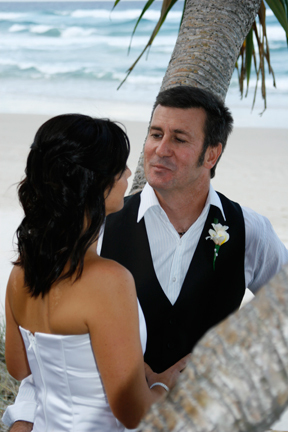 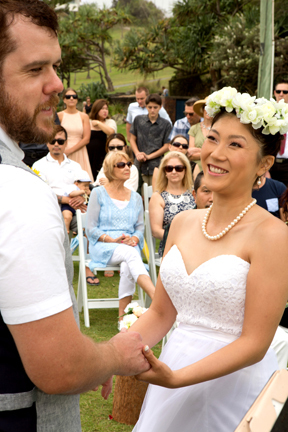 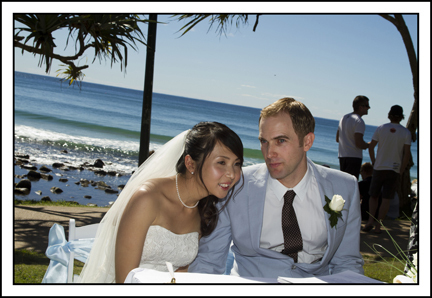 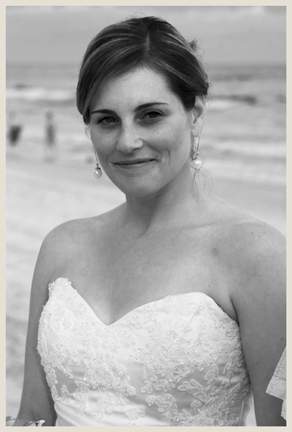 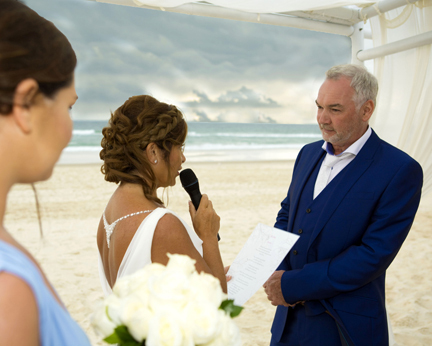 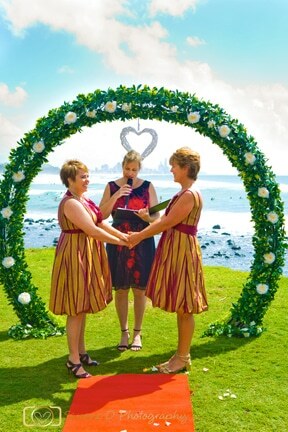 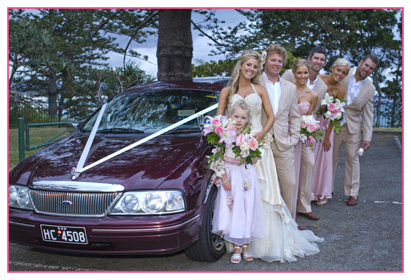 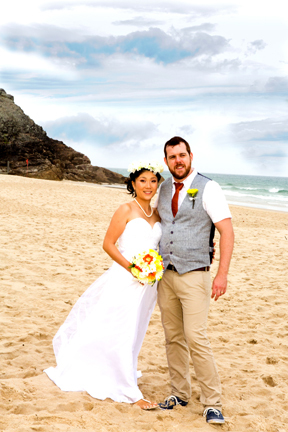 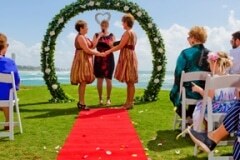 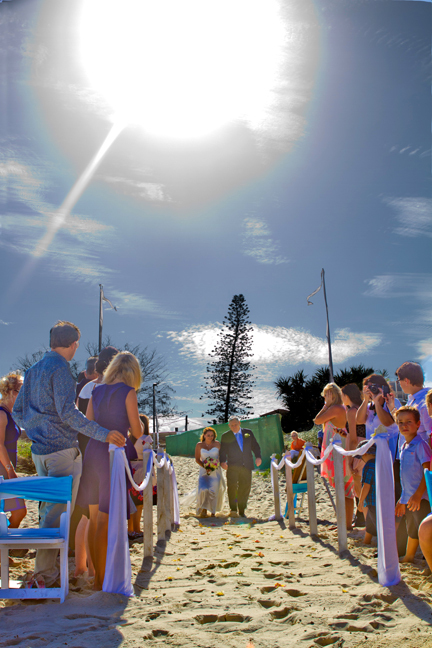 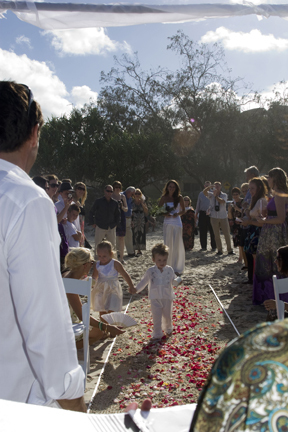 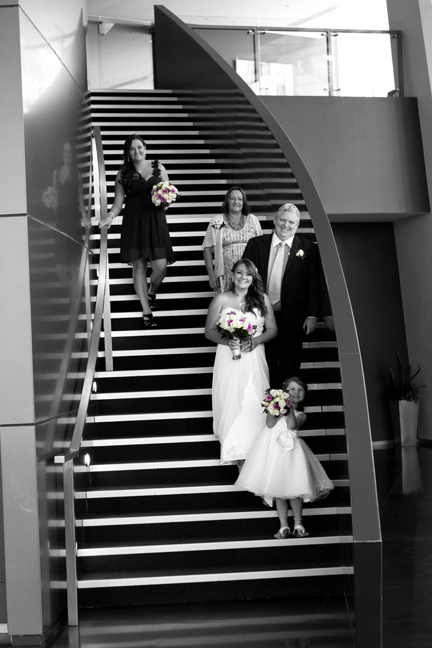 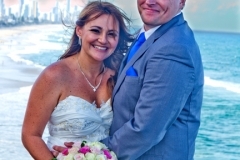 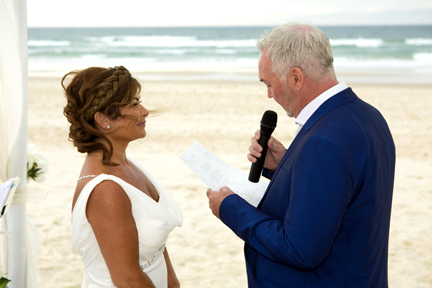 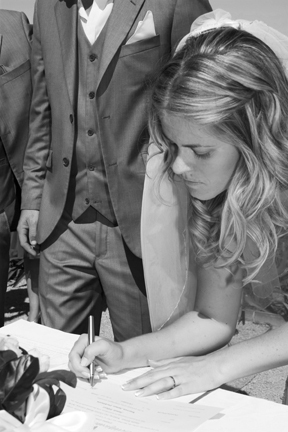 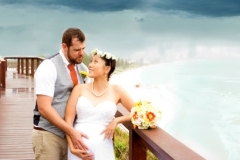 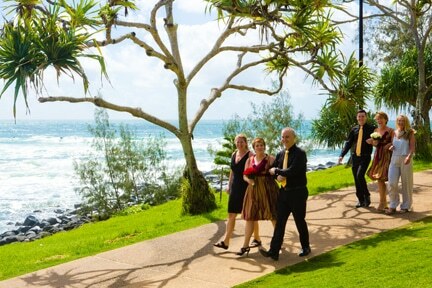 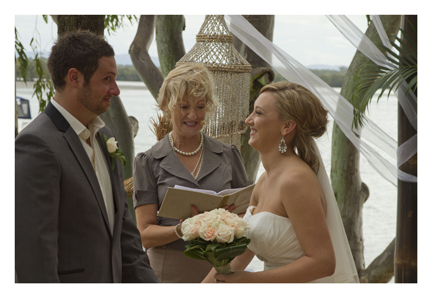 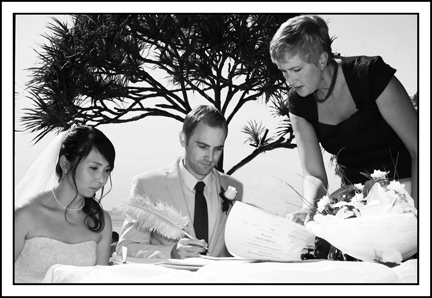 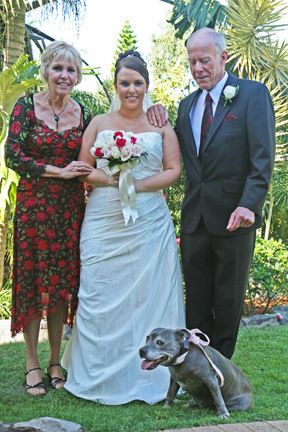 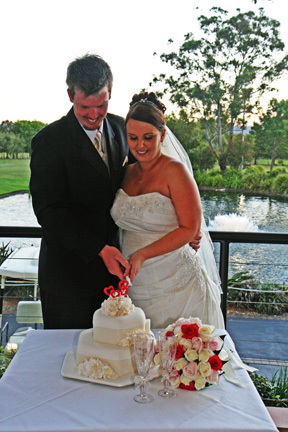 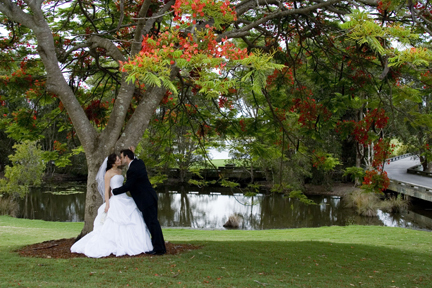 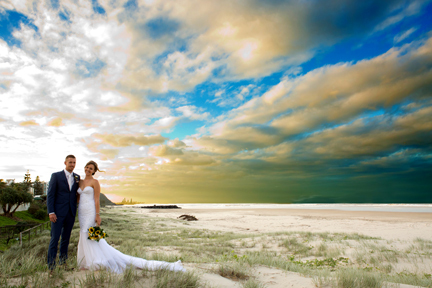 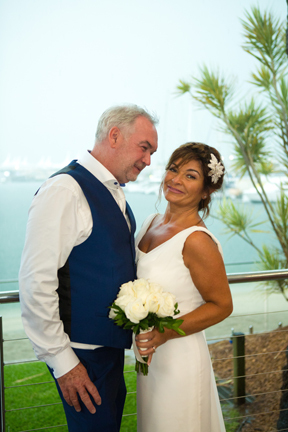 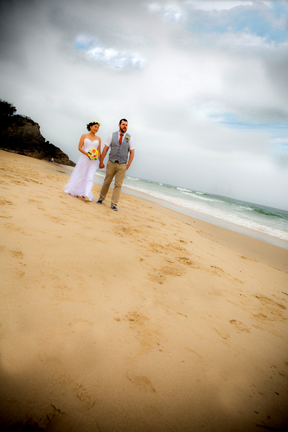 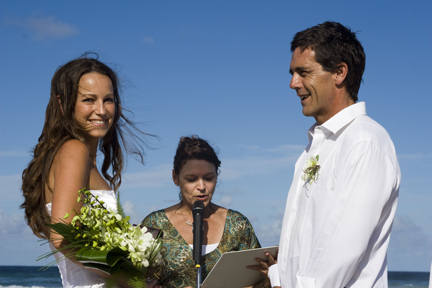 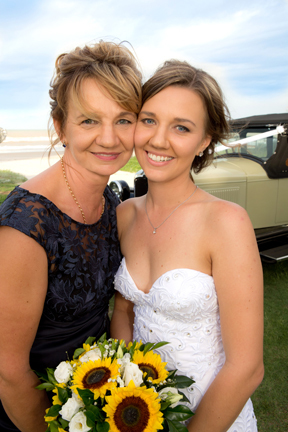 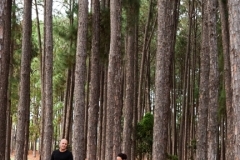 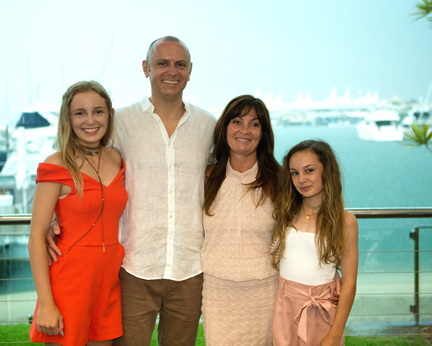 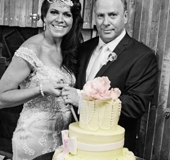 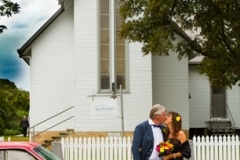 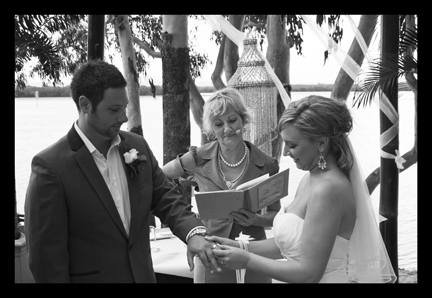 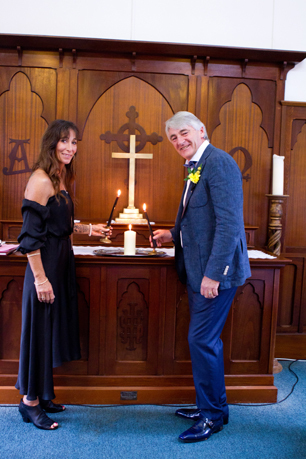 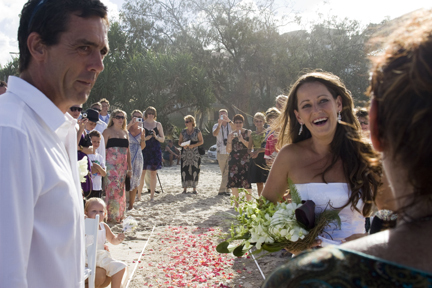 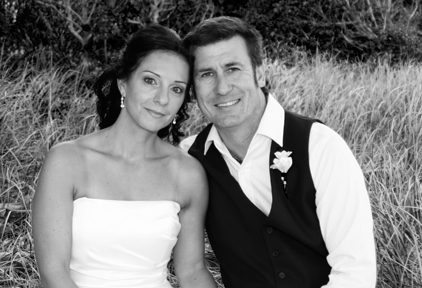 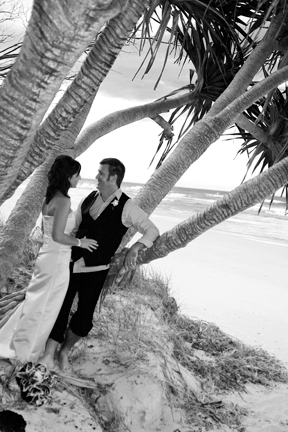 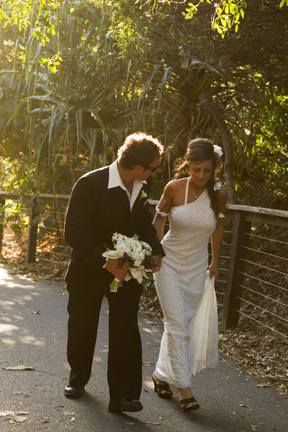 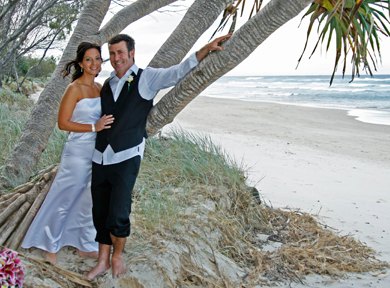 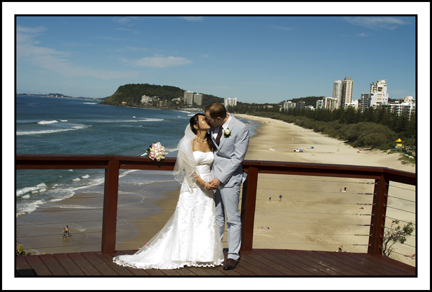 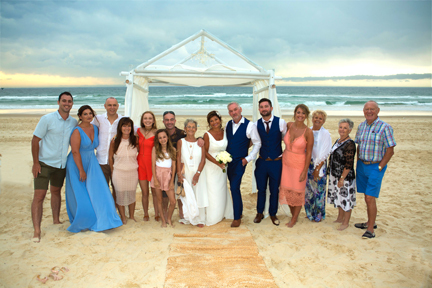 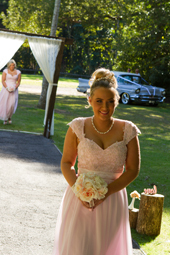 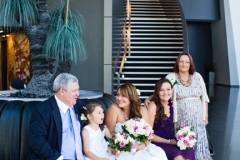 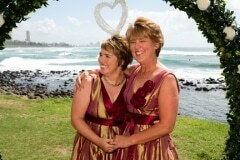 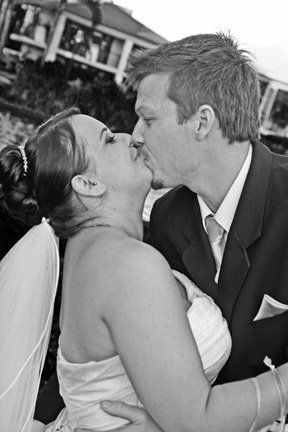 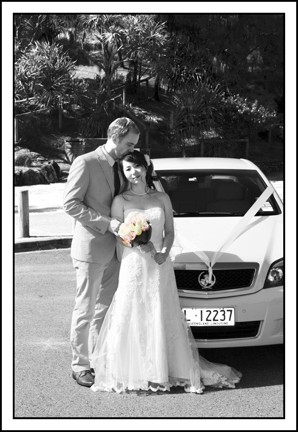 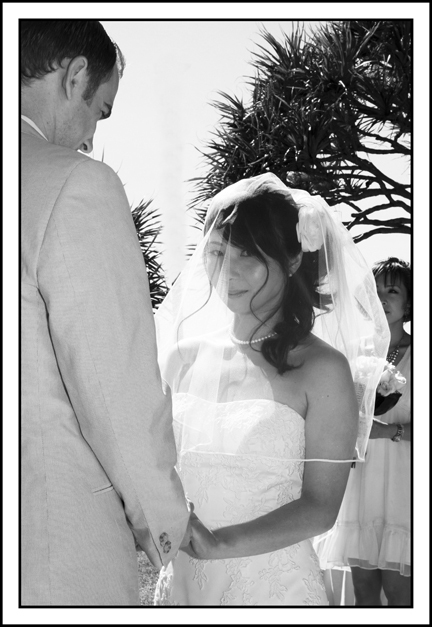 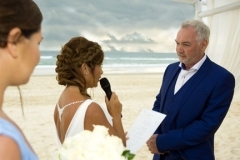 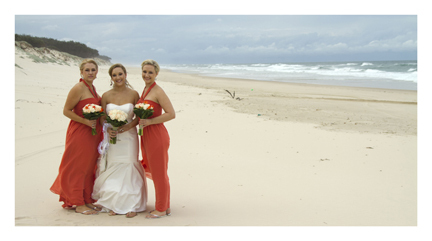 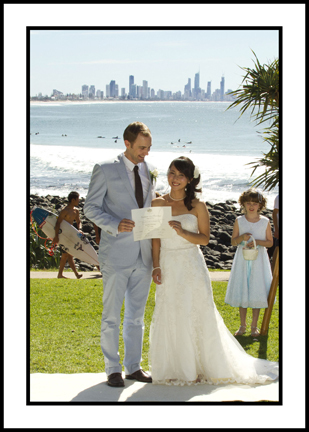 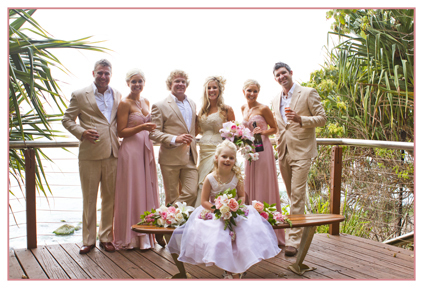 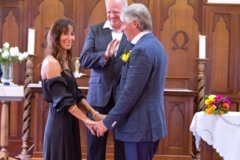 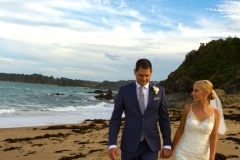 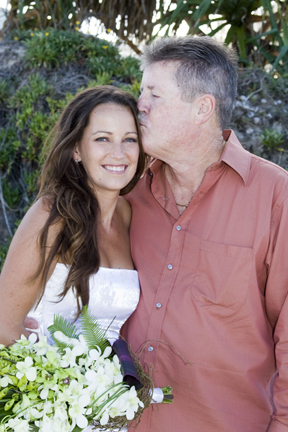 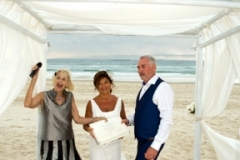 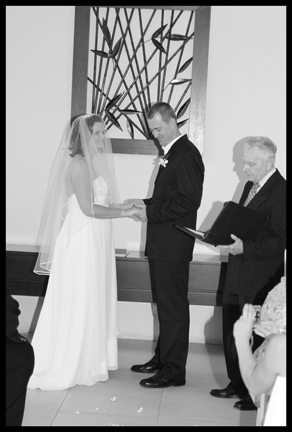 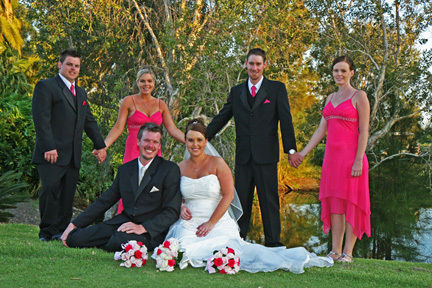 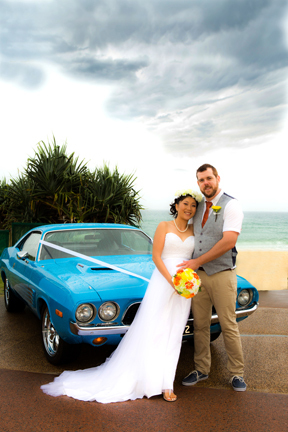 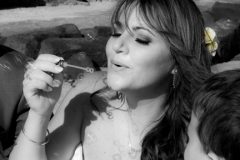 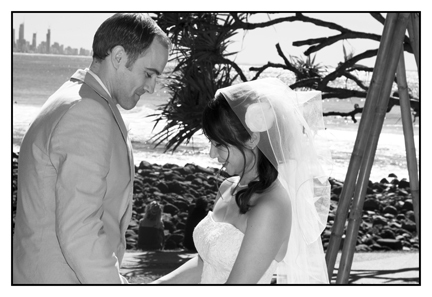 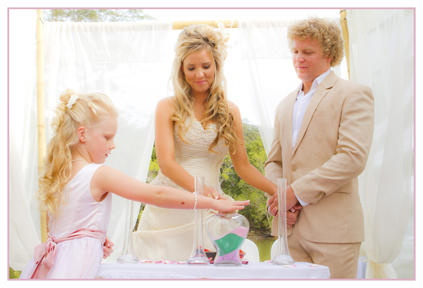 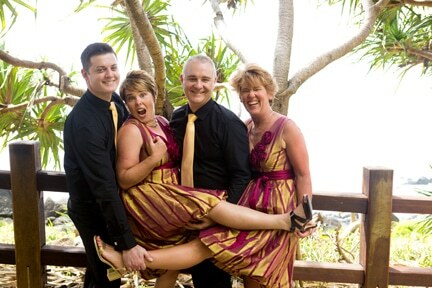 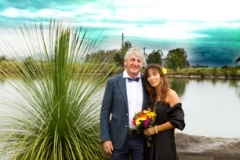 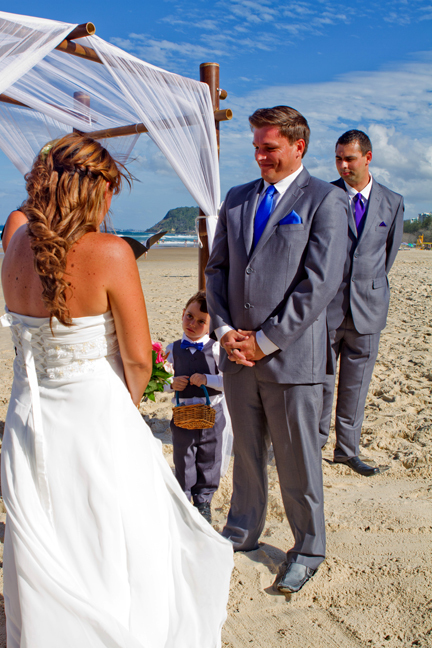 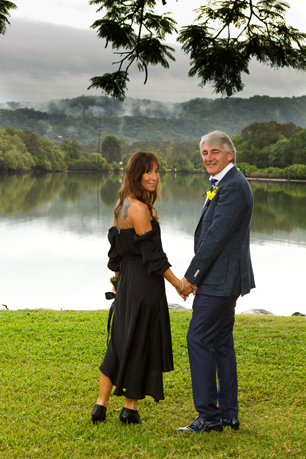 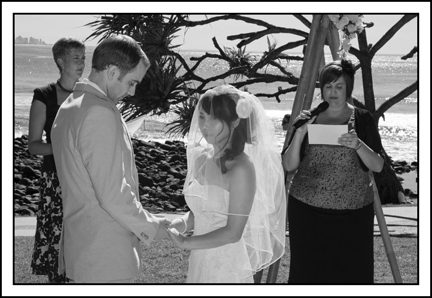 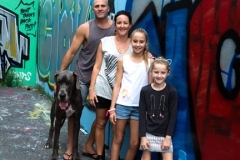 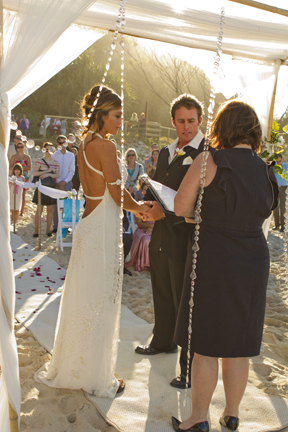 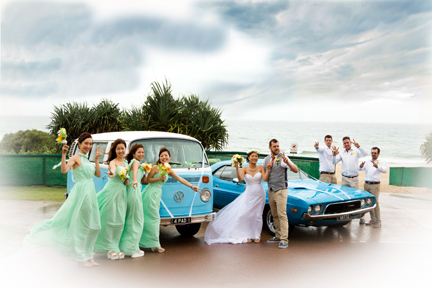 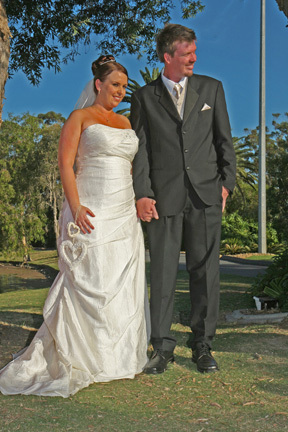 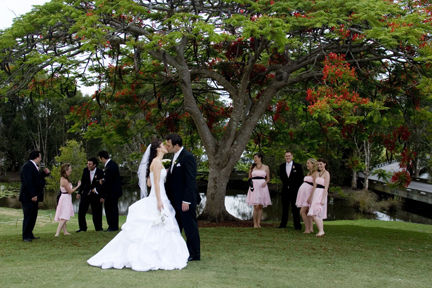 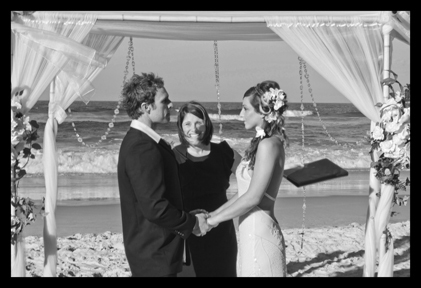 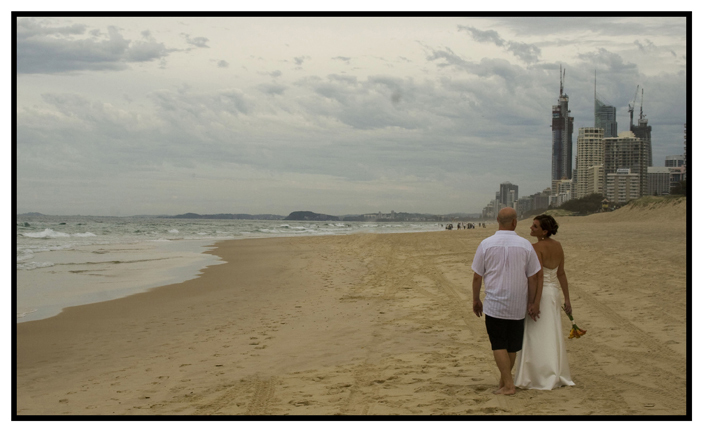 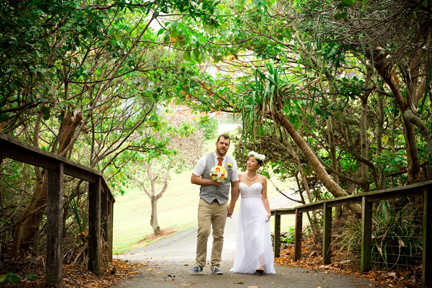 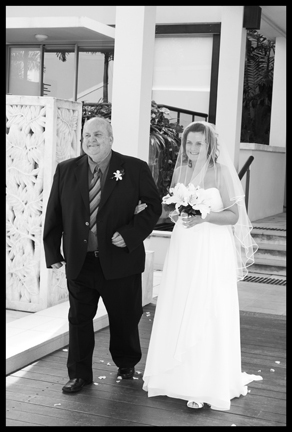 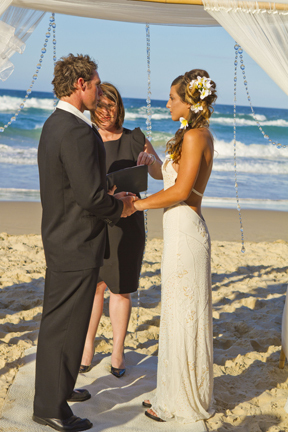 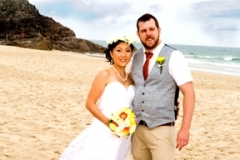 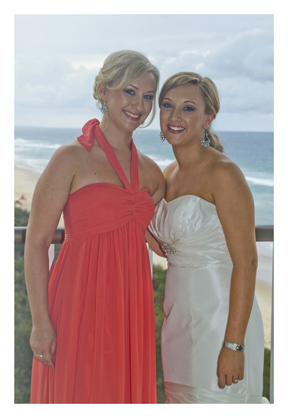 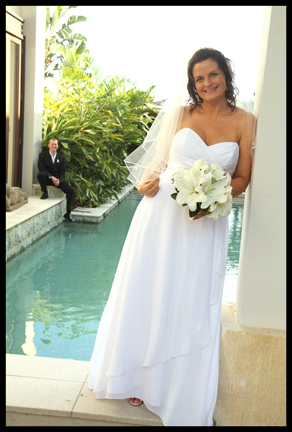 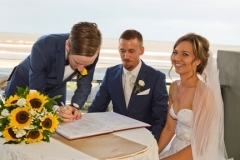 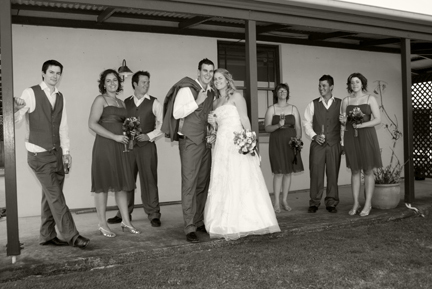 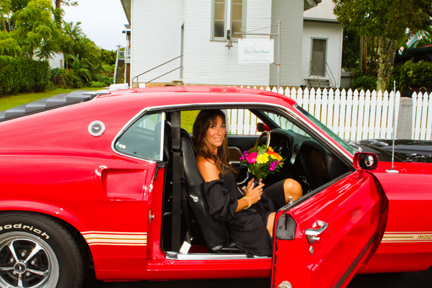 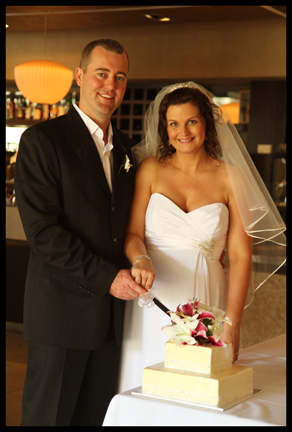 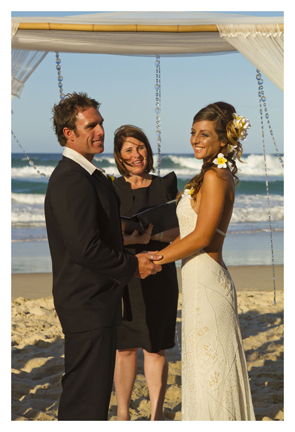 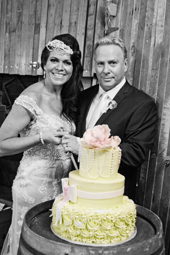 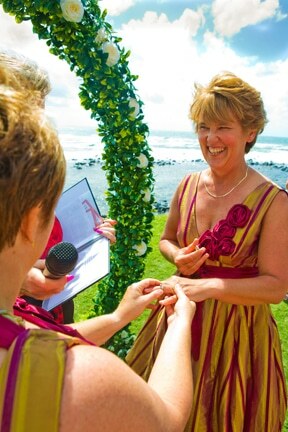 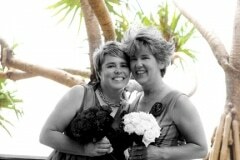 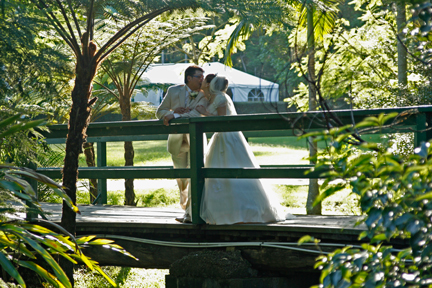 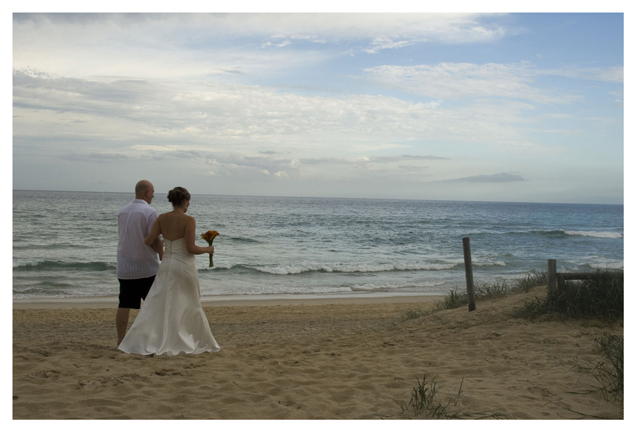 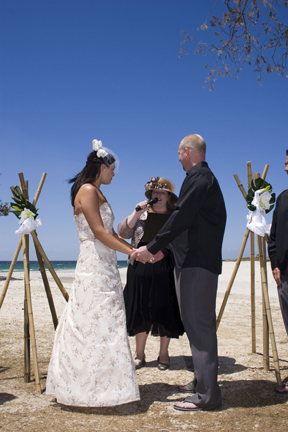 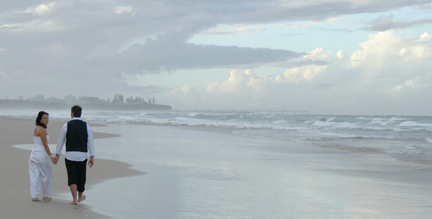 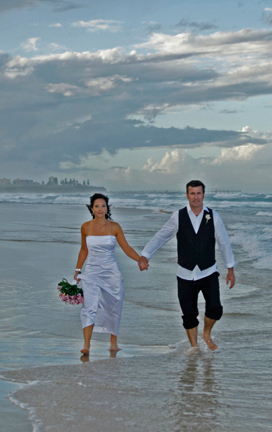 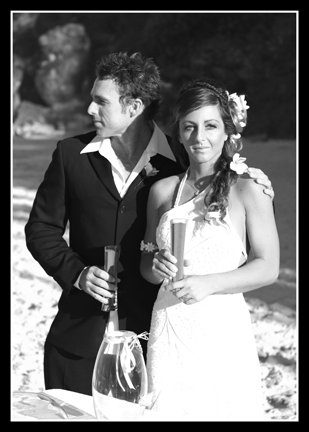 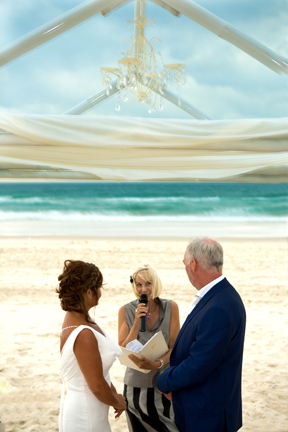 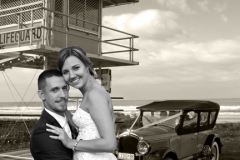 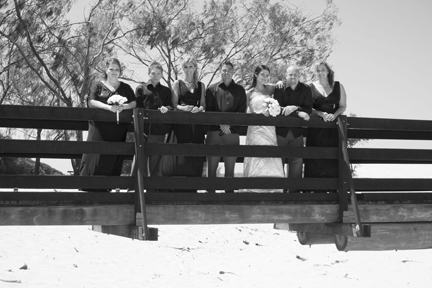 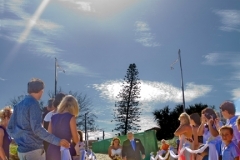 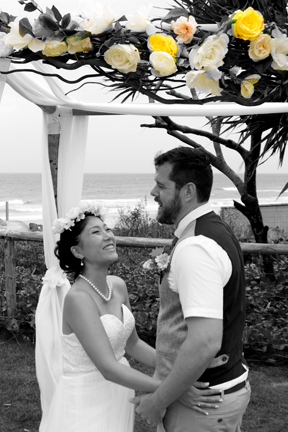 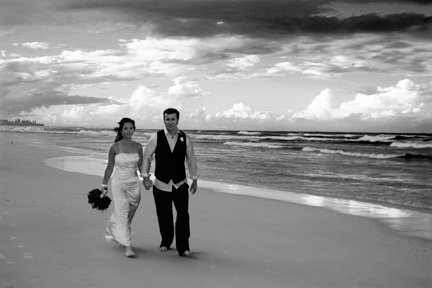 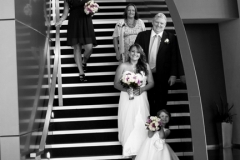 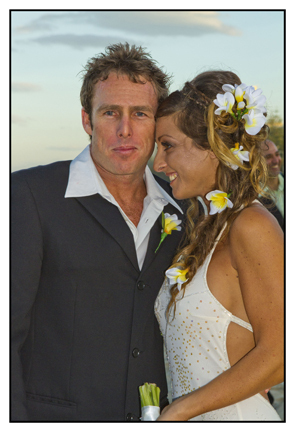 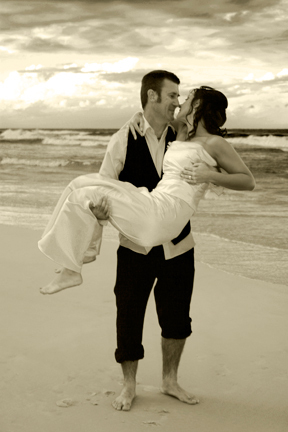 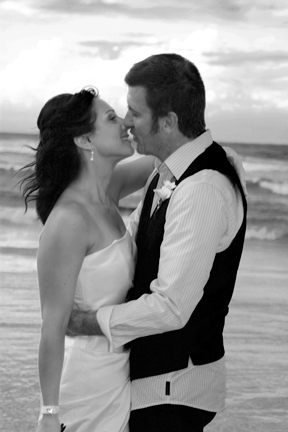 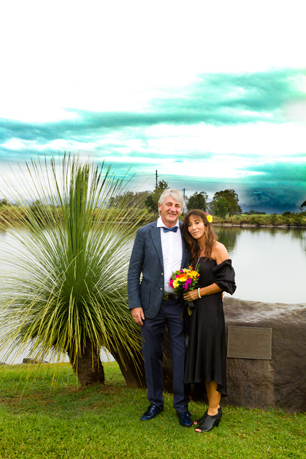 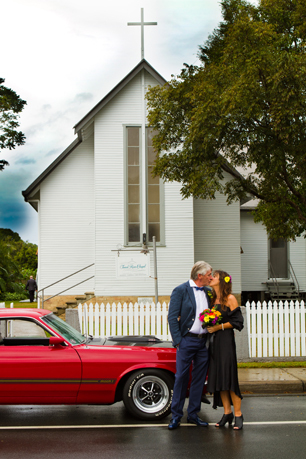 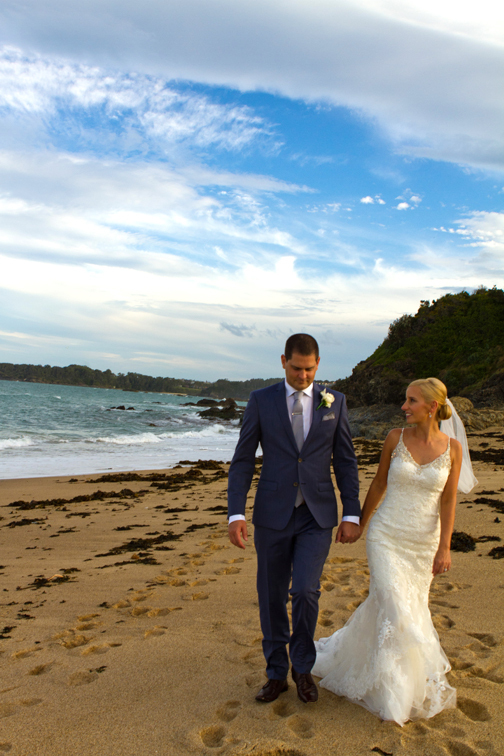 Sharna and Randall were married at Currumbin Beach on the Gold Coast. 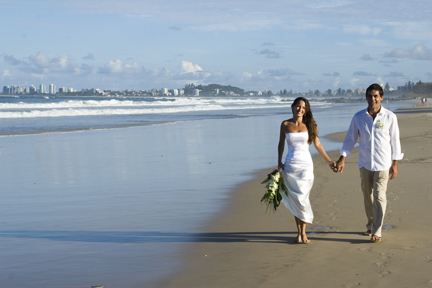 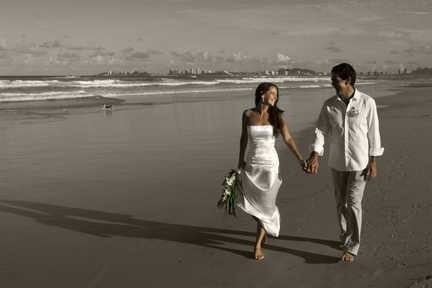 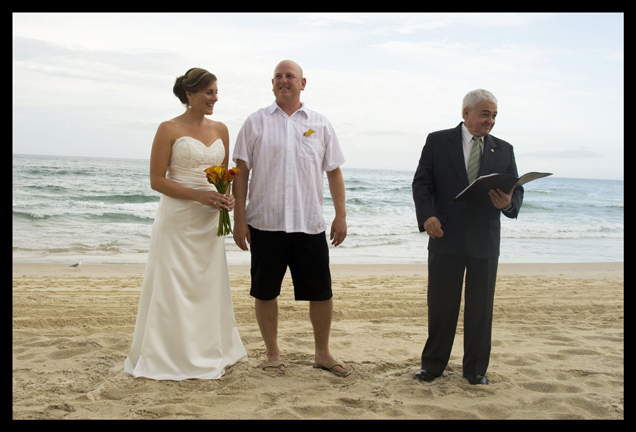 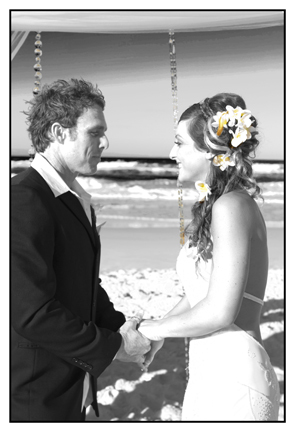 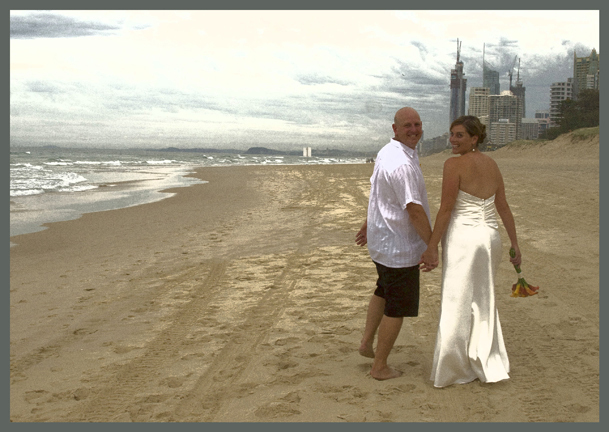 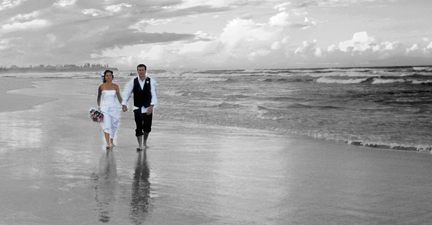 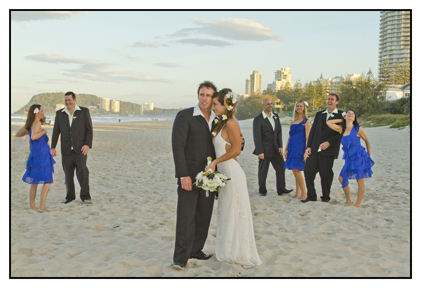 Wedding Photography-Currumbin Beach-Gold Coast……All of Gold Coast beaches are well photographed with weddings on them every week. 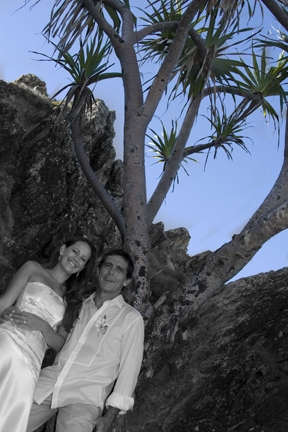 Currumbin is a little quieter than some of the other beaches like Burleigh, and has the very photogenic pandanas trees. 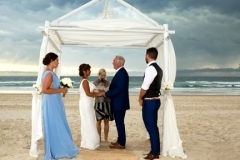 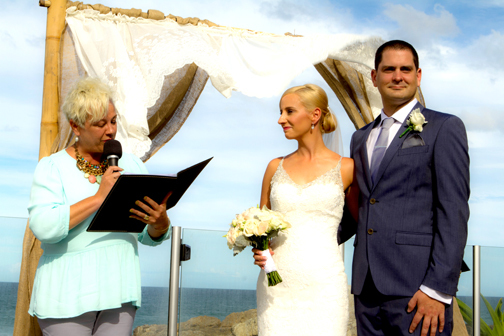 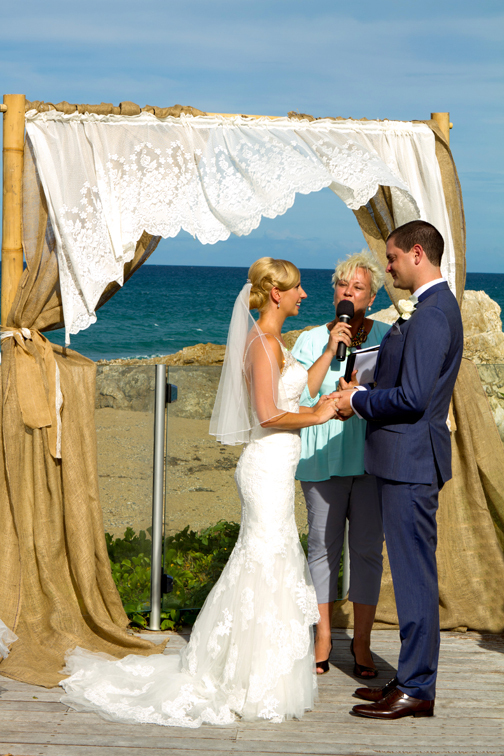 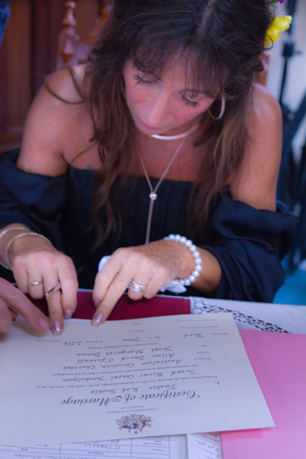 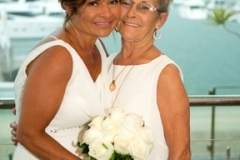 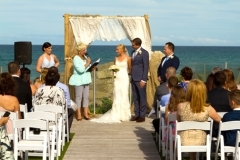 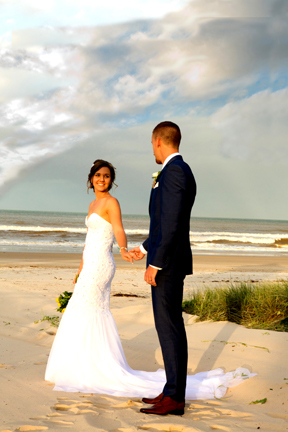 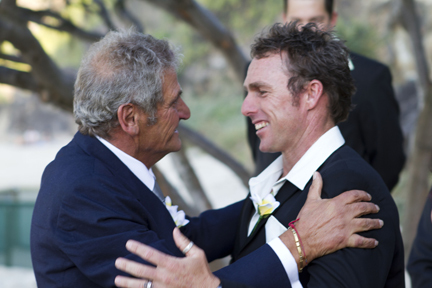 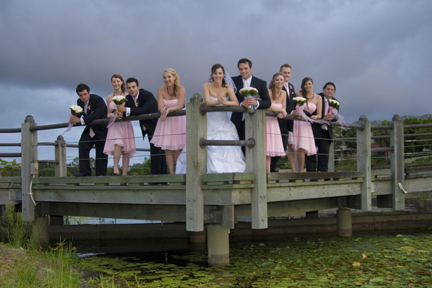 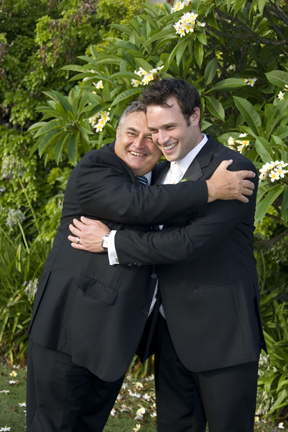 This wedding was next to Vikings Surf Club and the reception inside, such a beautiful venue, with the Surf Club so close to the ocean it gets flooded all around the club in severe weather. 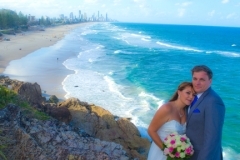 There is a huge rock also with steps up it with a view of the whole Gold Coast. 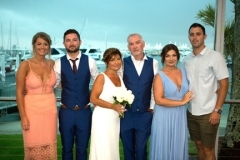 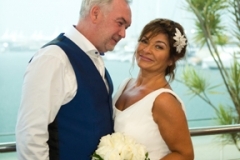 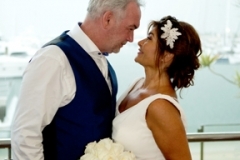 As Sharna and Randall, had a small wedding and so only got me to photograph the ceremony, family photos and some romantic ones on the beach. 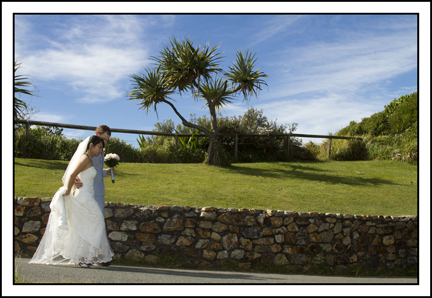 It was a perfect day weather wise. A few years later they re hire me to do family portraits at their home. 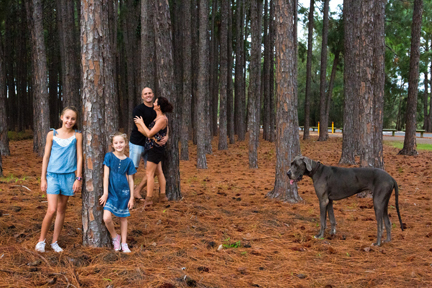 A new addition has been added to the family. 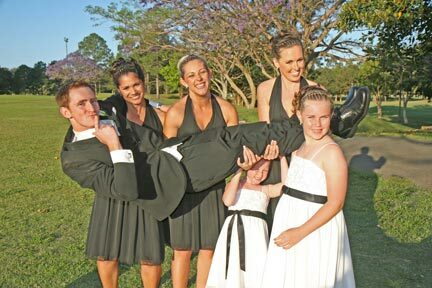 Brodhi is so cute and loves his big sisters. 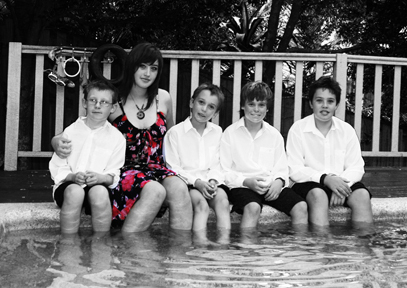 A link to those shots including a shoot in the pool I did a few years later when Bodhi was two. 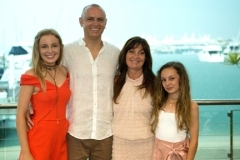 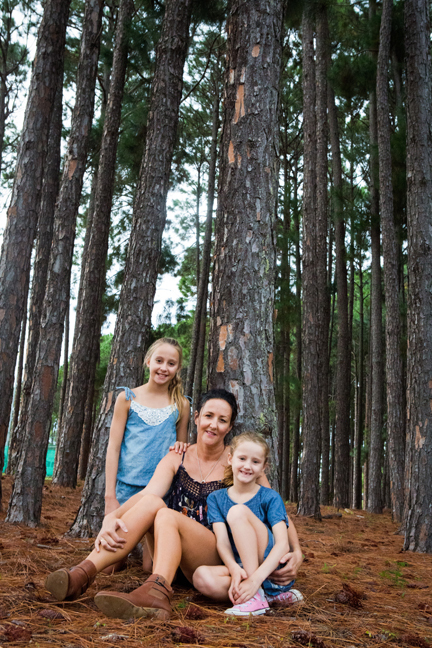 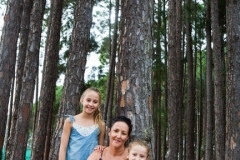 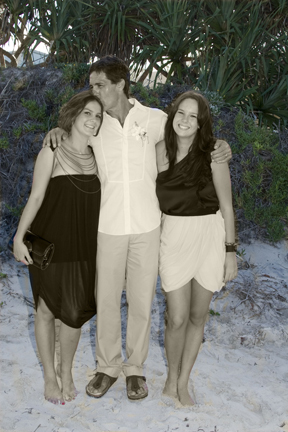 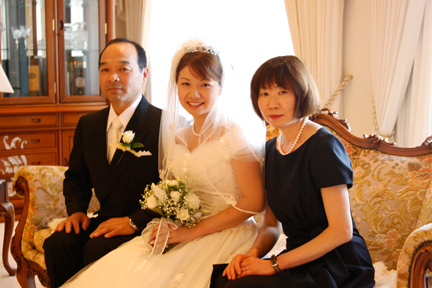 I love this family, so natural and happy all the time. 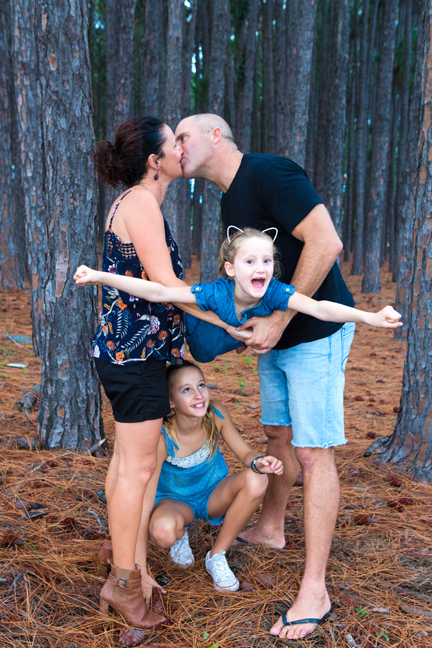 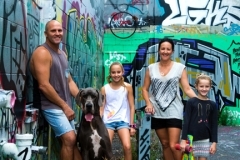 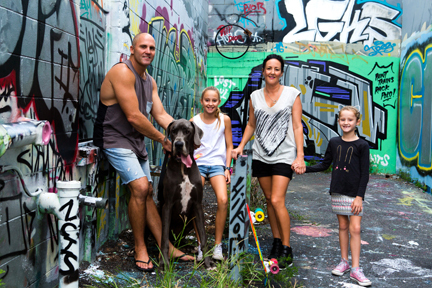 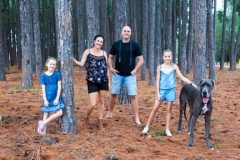 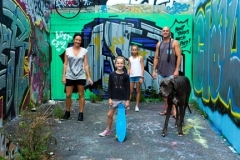 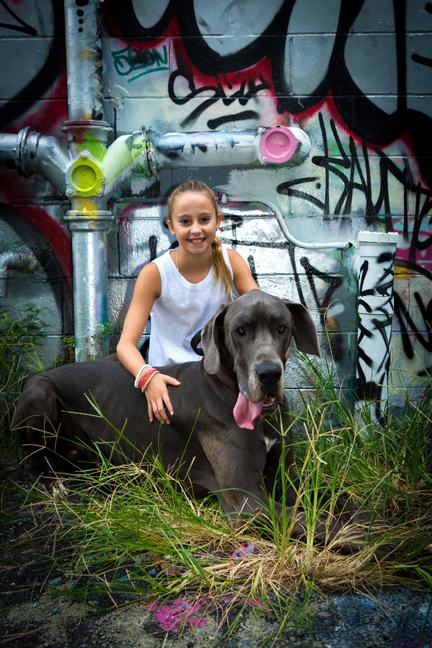 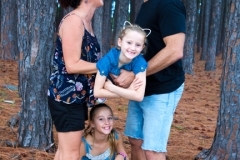 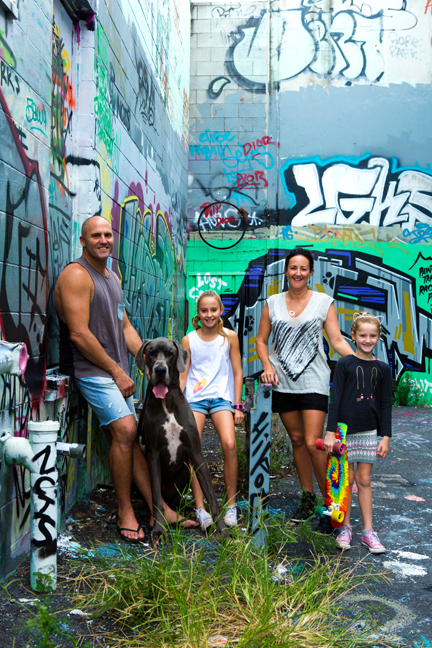 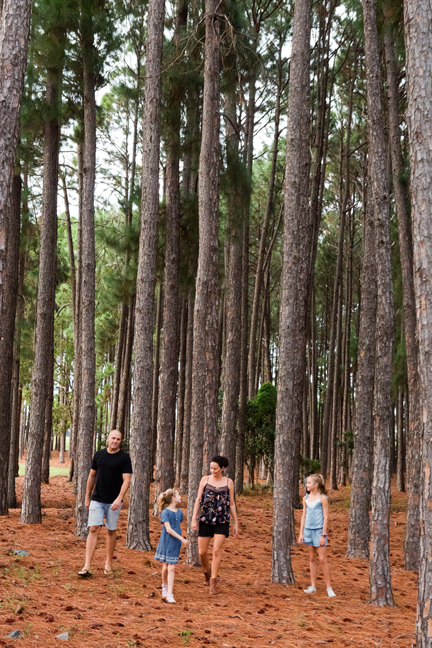 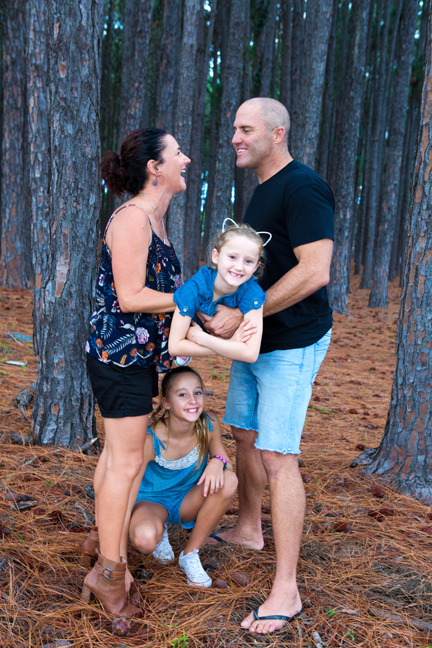 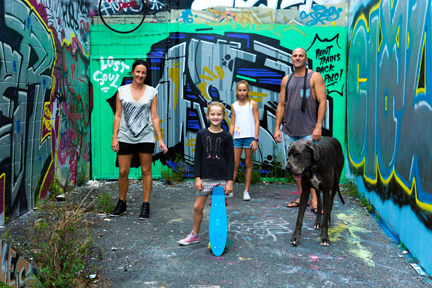 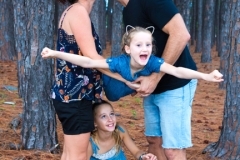 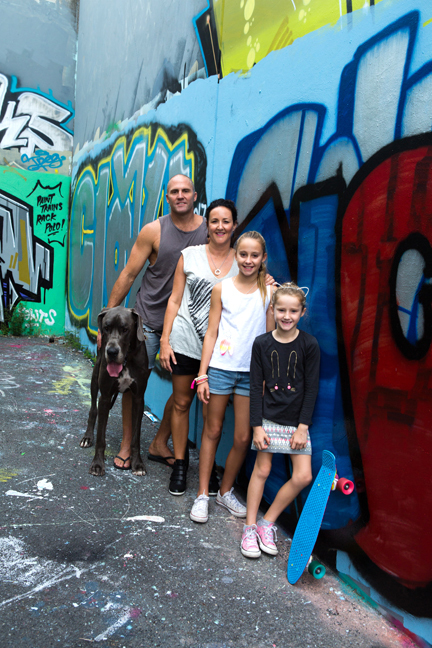 Sharna and Randall have since had another baby boy and I am looking forward to doing some updated family portraits. 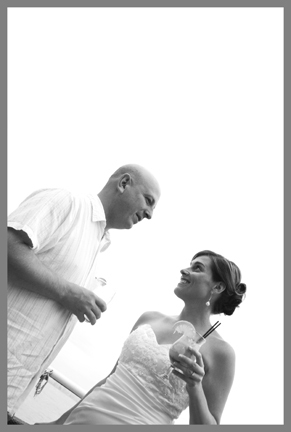 I like to reward past clients with a 20% discount on future shoots. 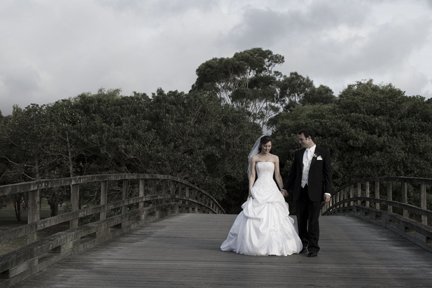 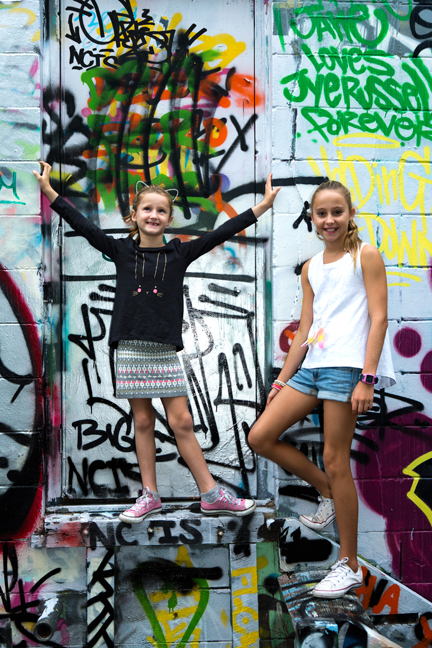 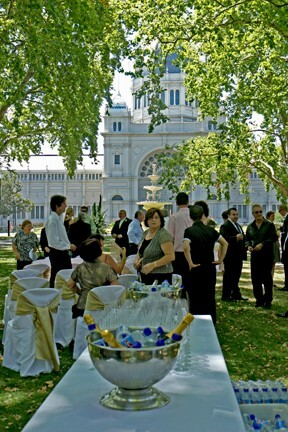 A different one for my portfolio, being shot in Melbourne in a park near Carlton. 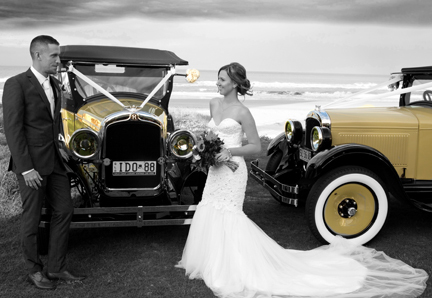 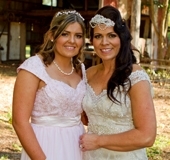 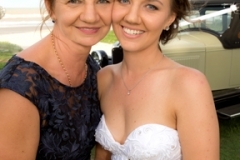 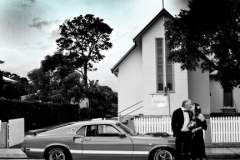 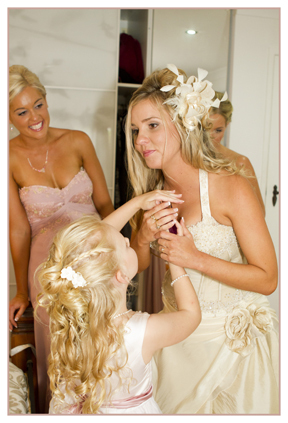 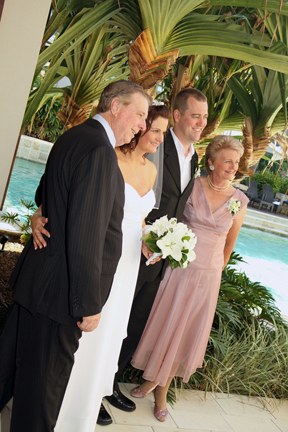 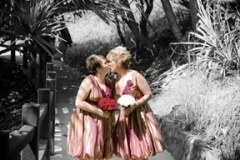 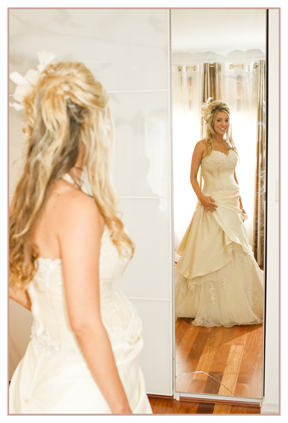 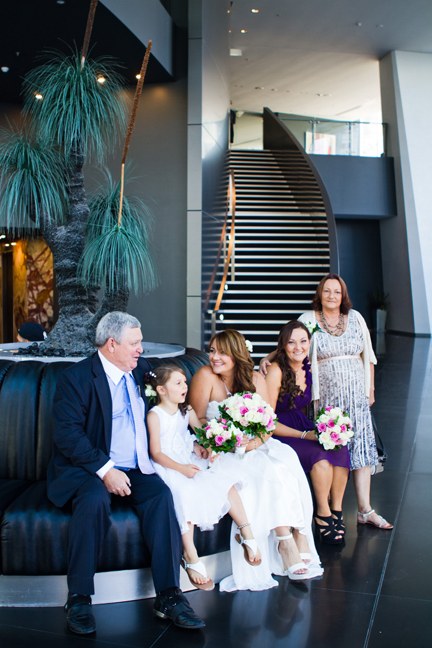 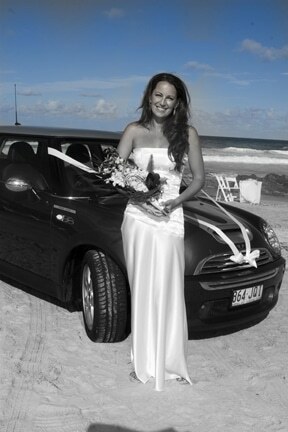 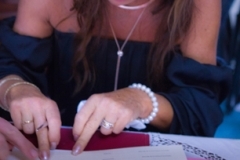 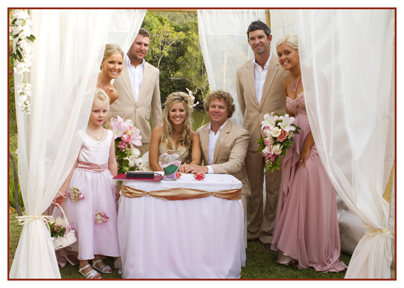 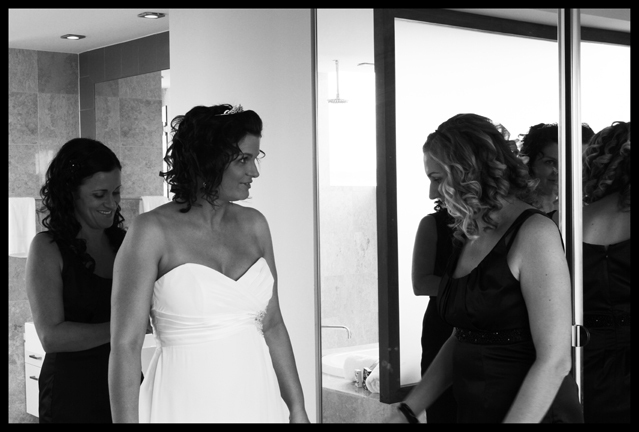 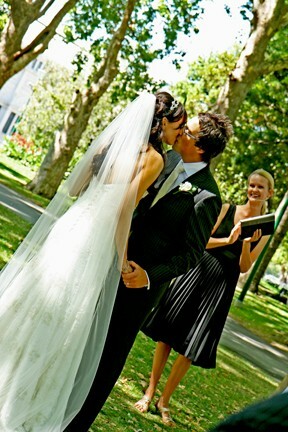 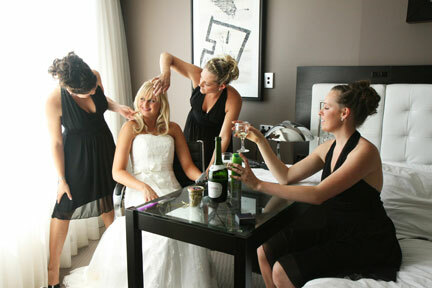 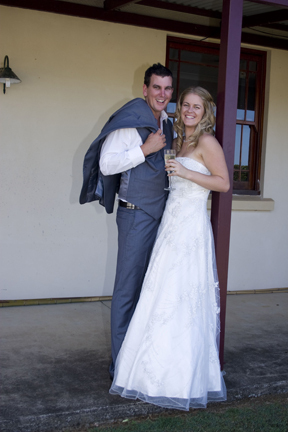 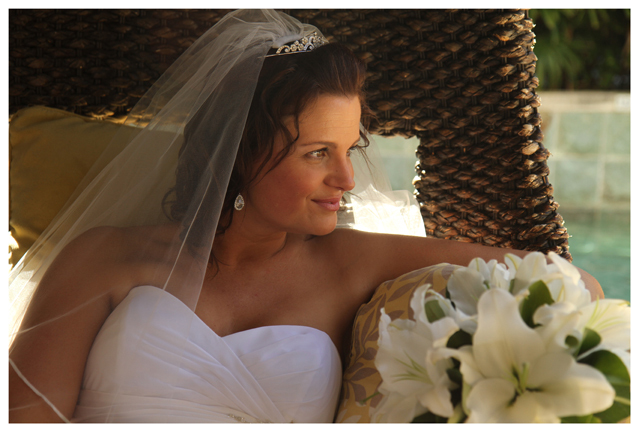 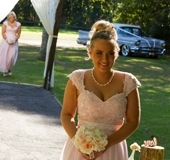 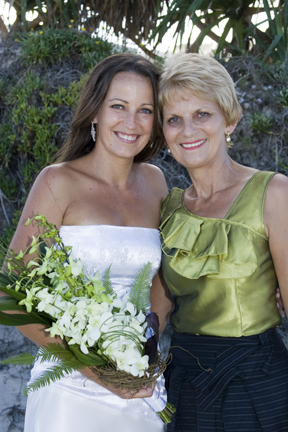 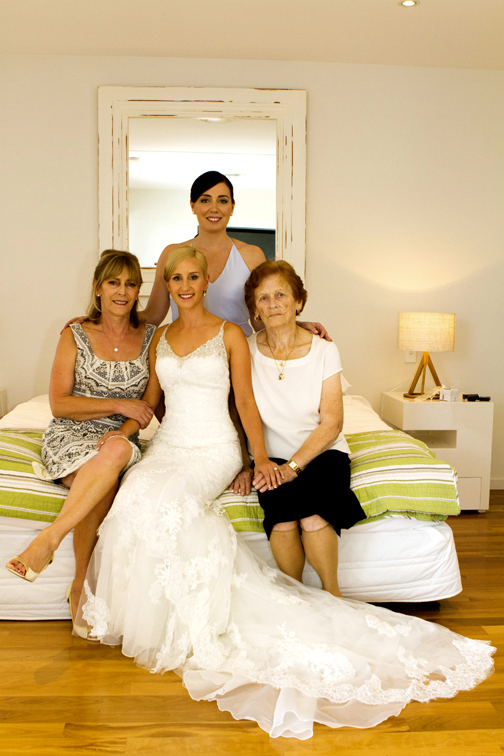 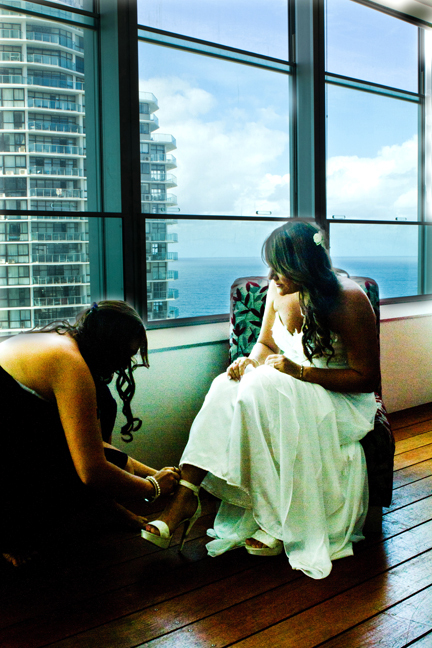 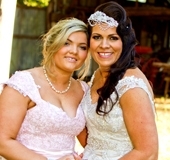 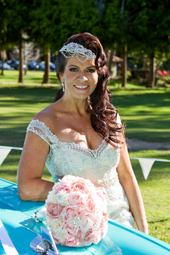 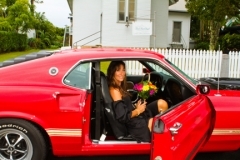 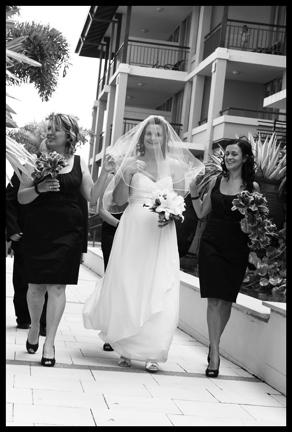 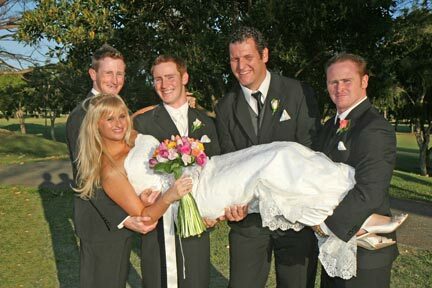 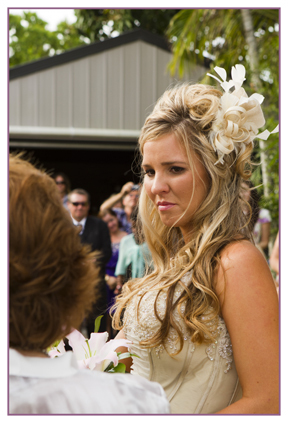 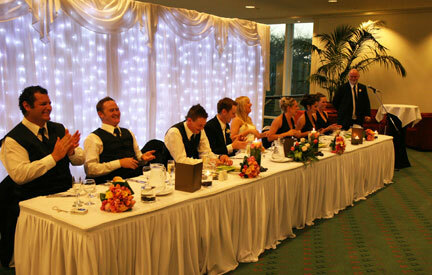 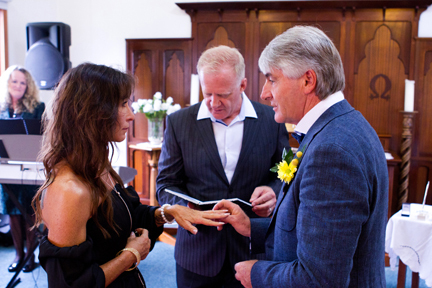 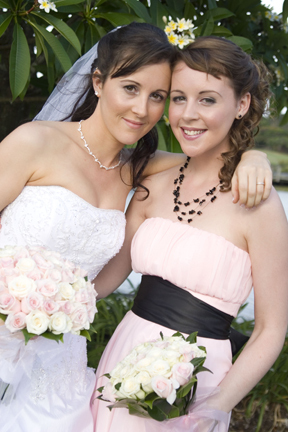 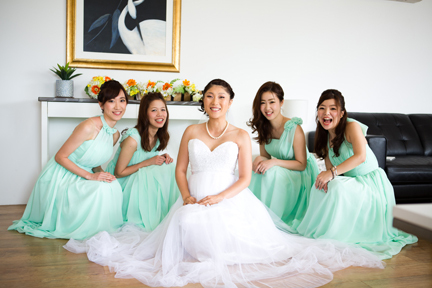 A very stylish bride and a totally different feel to the Gold Coast weddings that I do. 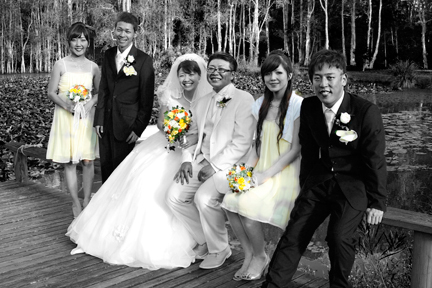 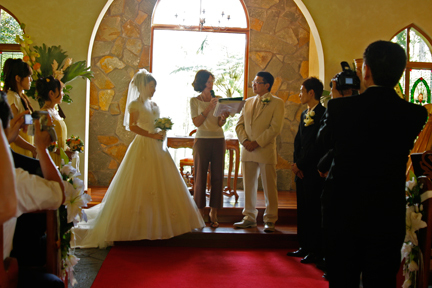 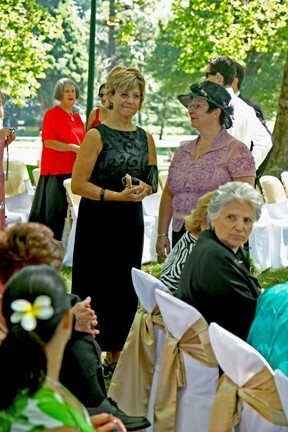 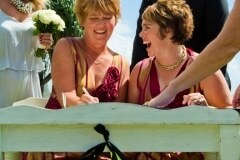 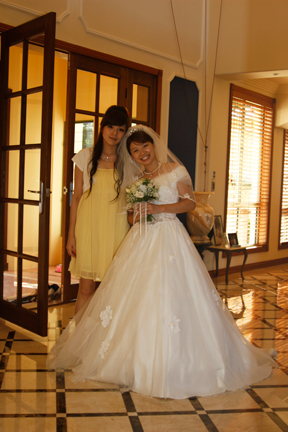 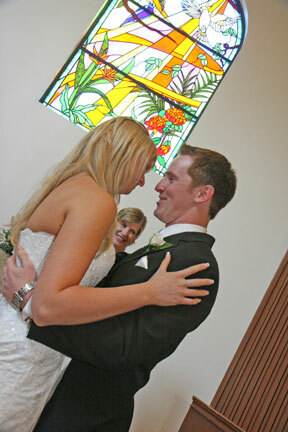 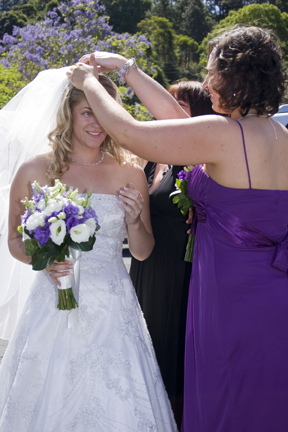 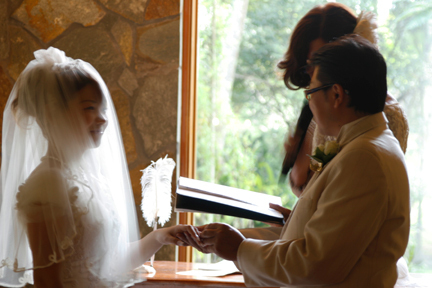 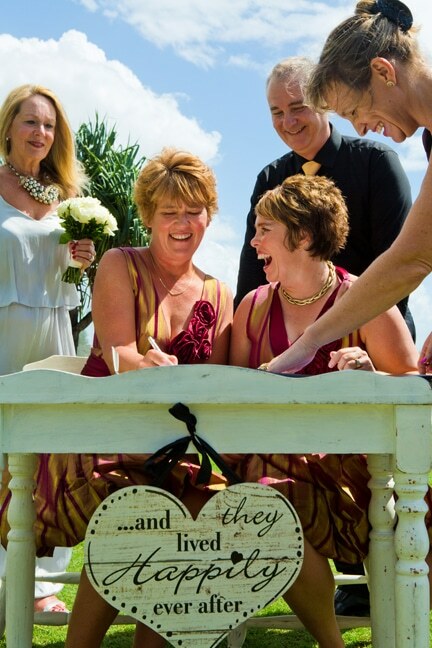 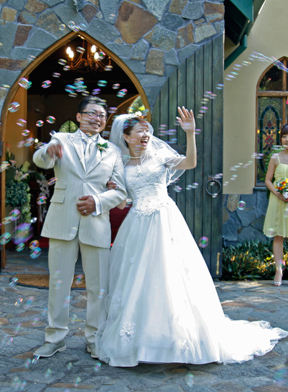 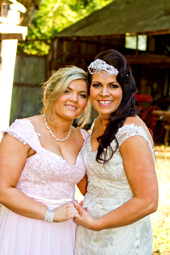 I was referred to the bride by her sister whom I had shot previously. 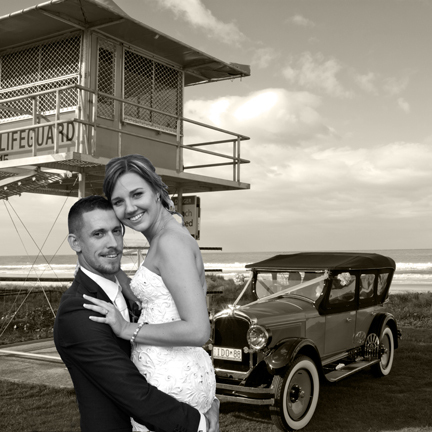 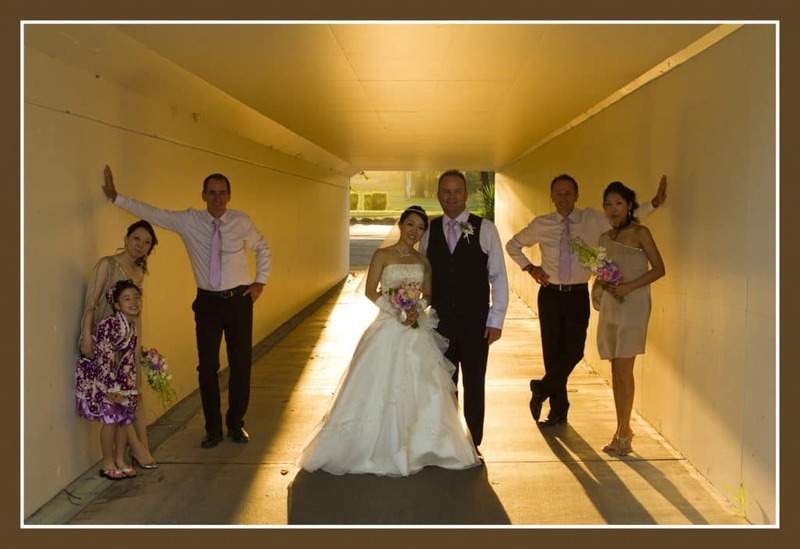 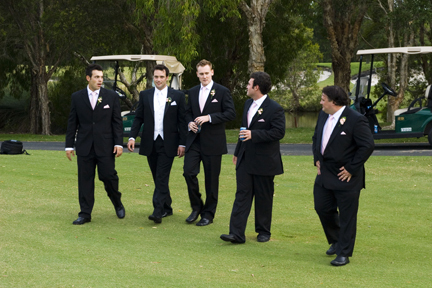 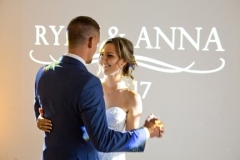 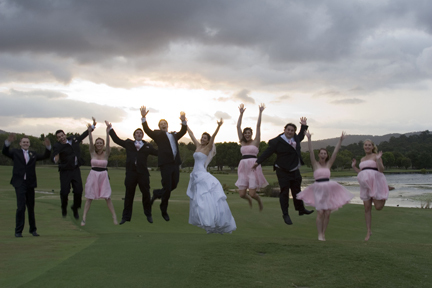 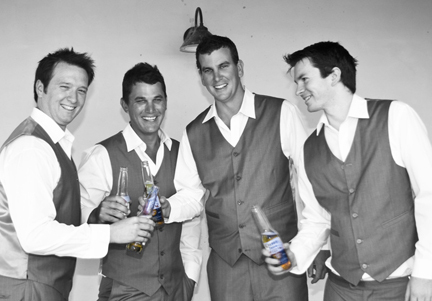 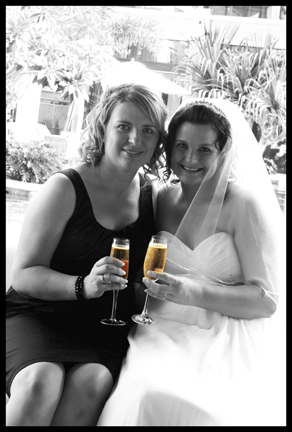 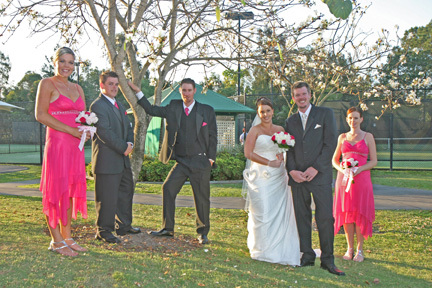 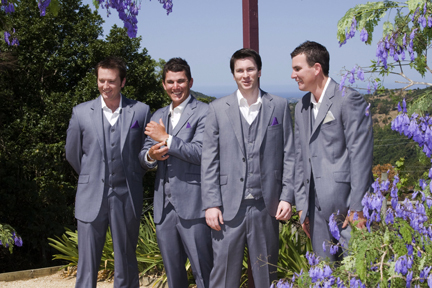 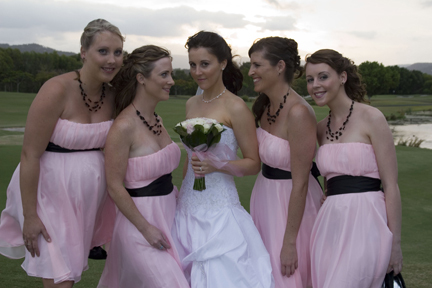 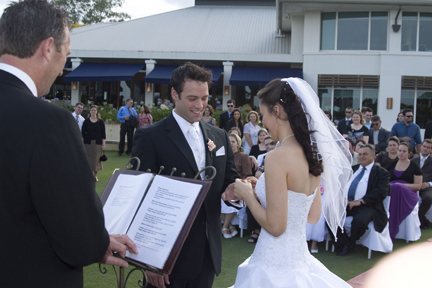 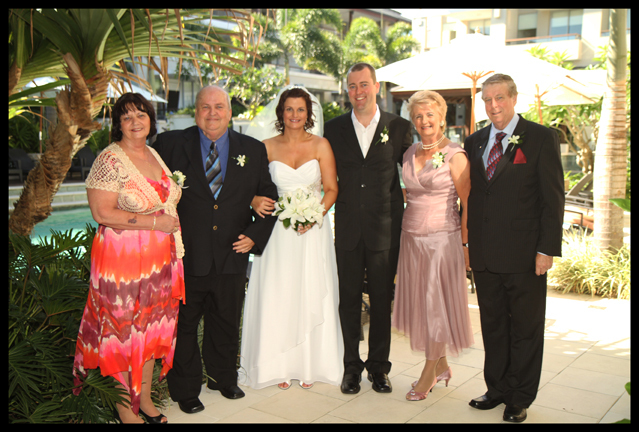 This wedding was completely shot at The Royal Pines Resort on the Gold Coast, it was a predominantly young and very fun crowd which you will see by some of the zany bridal party shots. 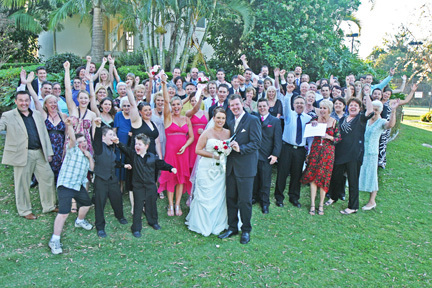 It was a fun day had by all!